dough | "blackberry-eating in late September"
How about from a new angle? Burnished and bronze and eggy and tender… it’s almost enough to make me run back to the kitchen and make another one. You? Here’s a recipe, just in case. 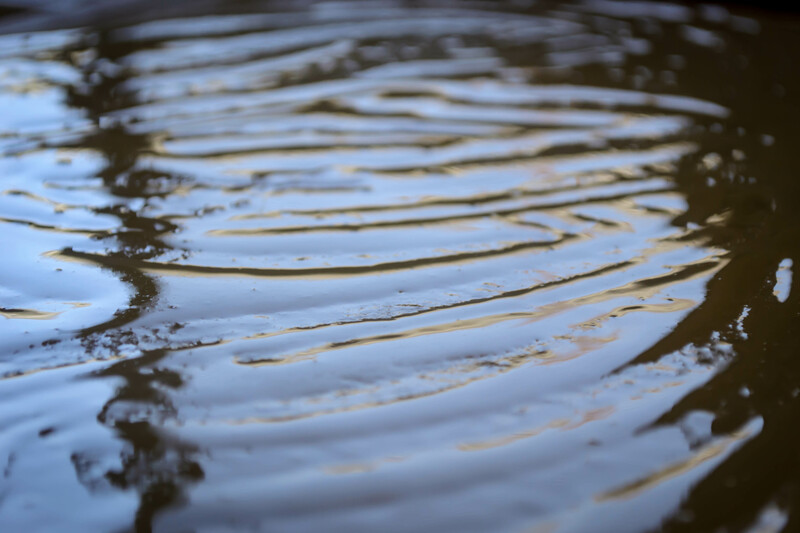 As I continue to write this blog, I think a lot about the kind of person I am, and the kind of person I seem to be becoming. I don’t mean this necessarily in a deep, philosophical or metaphysical way (although sometimes those things collide in the expanding corner of brain-space I use to think about food), but in a “what sort of food person am I?” kind of way. 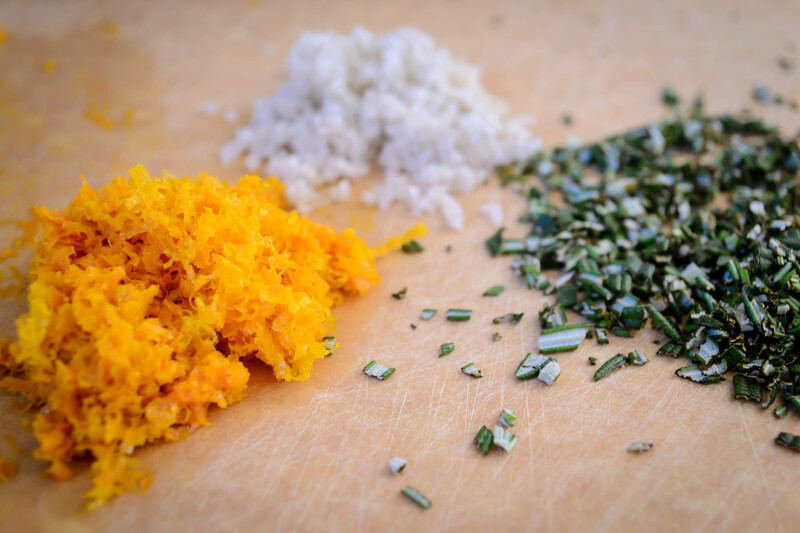 Example: probably about five years ago, I wanted to make fried rice but didn’t have one of those seasoning packets, not even when I dug all the way to the back of my pantry (I can hear you gasping in horror that I ever had one in the first place. What can I say? We all have guilty secrets about one thing or another), so I tossed a few things together and ended up with a sauce we really liked. I haven’t bought one of those seasoning packets since. From there, I added different spices, different quantities, different ratios of garlic and ginger… and suddenly the bags of frozen stir-fry vegetables we were tossing in weren’t good enough anymore. Fresh vegetables were now a mandate. Fried rice used to be a quick and easy dinner! Now it’s a totally from scratch undertaking. And that’s the kind of (food) person I am becoming. Example two: I used to subscribe to a number of cooking magazines. Though I let my subscriptions run out (their cost made them an unjustifiable luxury during graduate school), I continued to use the collection I’d amassed, restricting myself to cooking recipes only from the current month’s issue: no August recipes in April. This was an attempt to keep myself seasonal and inspired. Well, this year it stopped working. As each new month began, I’d eagerly flip through the appropriate month’s issue looking for something to excite me and drive me into the kitchen. I’d close each issue with a sigh and toss it to the side. There were many, many recipes I hadn’t tried before, but there just wasn’t anything in there that felt inspiring anymore. Well, almost. Once in a while, I’d find a recipe that I’d consider for a moment and then turn to N. and say something like, “this might be good, if you made it into a pasta dish instead of a sandwich and added some sundried tomatoes and herbed goat cheese.” And I’d do it, and we’d be pleased with the result. After a few months of this sort of thing, interspersed with a probably indecent amount of complaining about how I was bored by these recipes, N. finally turned back and said, “I think you’ve leveled up.” Translation: your imagination has moved beyond what these magazines offer and you are now on to bigger and (we hope, for the sake of our taste buds) even better dishes. And that’s the kind of (food) person I am becoming. 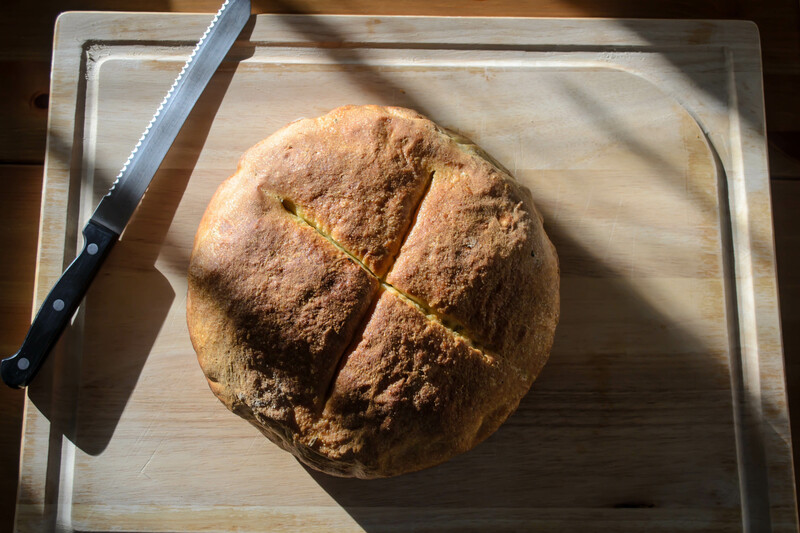 Example three: since I’ve started baking bread, I’ve been trying to plan meals around a yeasty undertaking once a week or so, to keep myself in practice and find “the best” versions of each type of baked good I undertake. This has resulted in a development I’m not sure I’m entirely comfortable with: though I have continued to buy a weekly loaf of bread (I really like, oddly enough, the plain old sourdough loaf the bakery department at my grocery store produces) when I go shopping, I haven’t bought hamburger buns, or pie dough, or pizza dough, since beginning this little dough experiment. Am I really the kind of person who no longer considers store-bought burger buns acceptable? I’m not sure I’m ready for that kind of commitment, but that seems to be the kind of (food) person I am becoming. Does that make me a snob? Maybe. It certainly makes me one of those “oh, I just made it by hand” kind of people you sometimes feel inclined to secretly snarl at. But no one in the direct friendly fire of these developments is complaining, so maybe it’s not entirely a bad thing. But it does make things more complicated, and more difficult to achieve, sometimes. 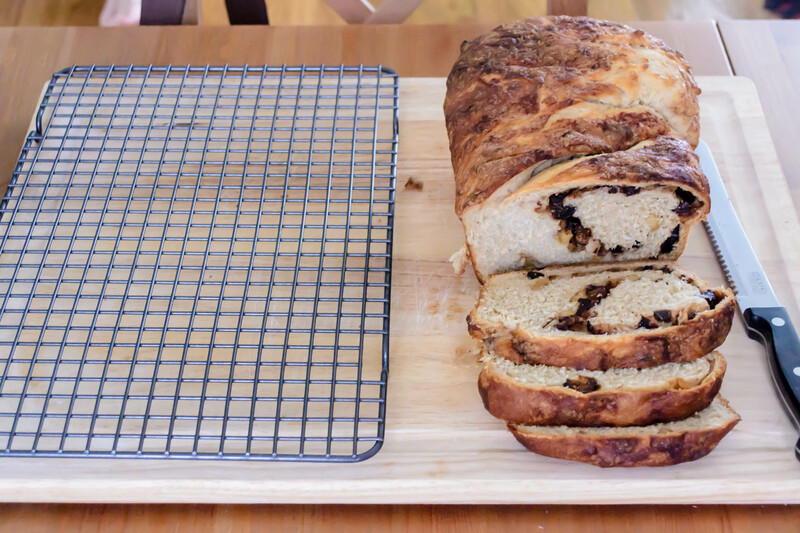 Like when I decided I really wanted cinnamon-raisin bread for breakfast, but instead of picking up a pre-packaged loaf as we shopped, I was determined to make it myself. And then I forgot to buy raisins. What’s a girl to do, with the plan in her head and the taste already in her brain and the soft chew of homemade bread aching in her teeth? 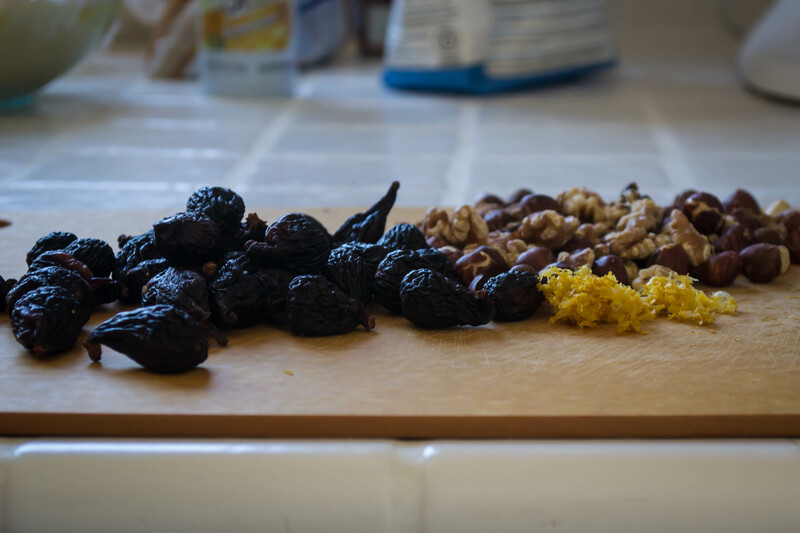 Well, she chops up some figs, and some well-toasted walnuts, and some hazelnuts for good measure, because she was almost out of walnuts. 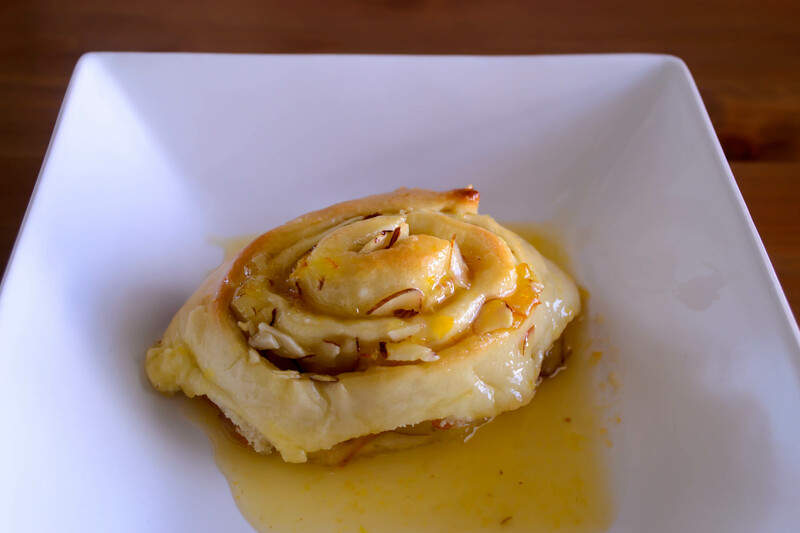 She whirls together a soft, supple dough laced with brown sugar, cinnamon, and sour cream. Nutmeg and lemon zest find their way in. 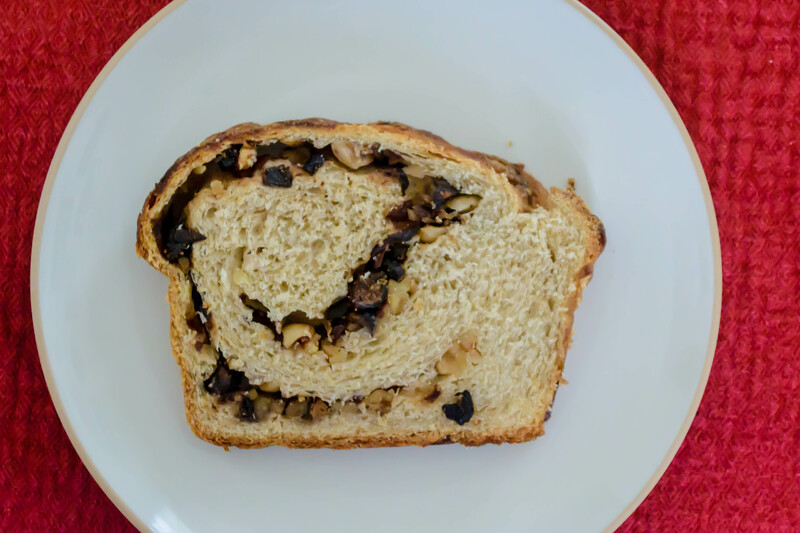 And she rolls up a crunchy crumbly sweet layer of fruit and nuts inside the dough, twists it to dispense the swirl, and lets it rise into a triumphant bulging loaf. And what results, after it’s been rubbed with butter and cinnamon sugar for good measure and baked until golden and puffy, is something that drives standard cinnamon-raisin bread straight out of her mind. 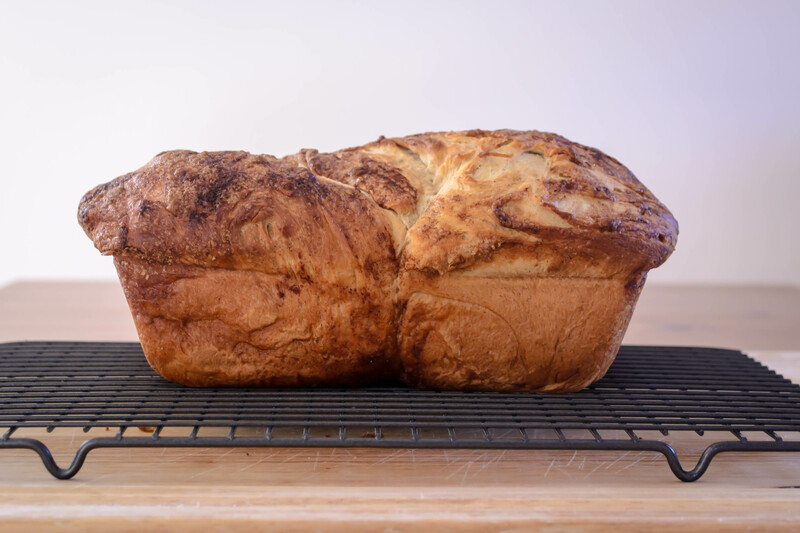 The sour cream adds a beguiling richness to this loaf, making it almost unnecessary to add a slick of butter or cream cheese to a breakfast slice. 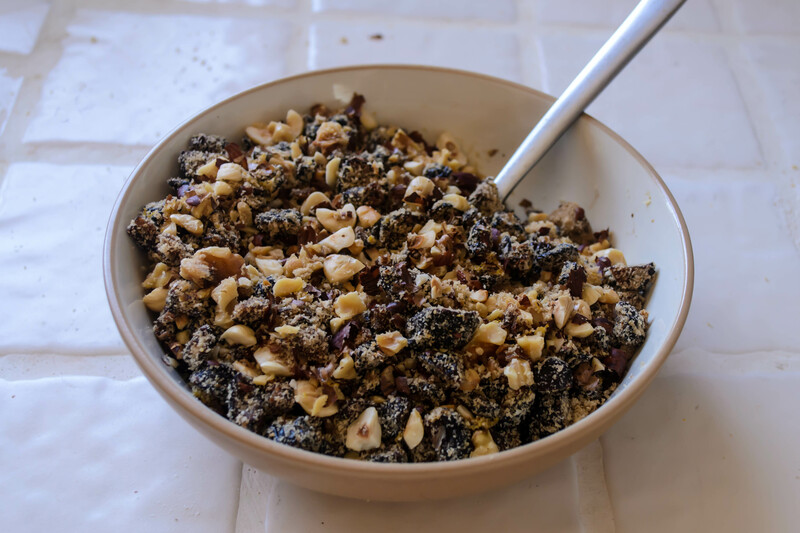 The figs and walnuts are a pleasingly earthy combination, and though I wasn’t crazy about the lemon zest I added at the spur of the moment, you might like the brightness it brings to the filling. So. Food snob? Maybe. 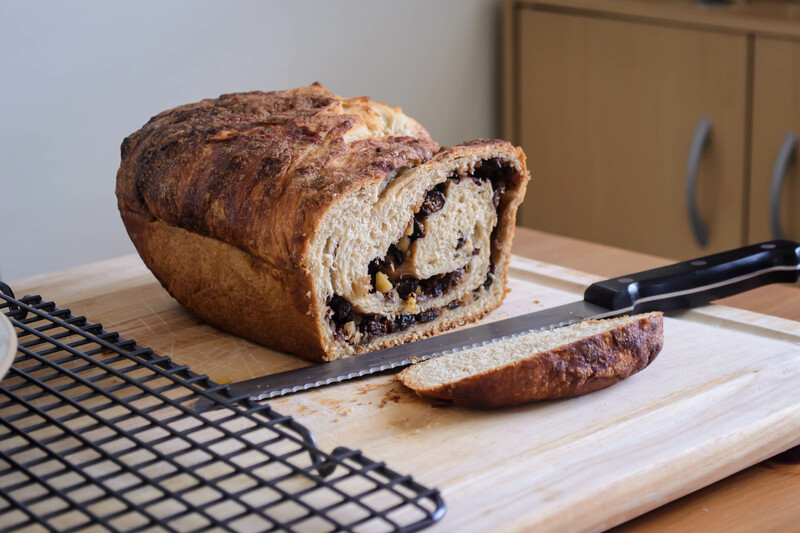 But really, when you’re sitting down to breakfast with a loaf of homemade, fig-filled bread, your mouth is probably too full to complain. Stir the yeast into the warm milk and let it sit for 5 minutes or so to allow the yeast to wake up. It will begin to get bubbly and smell warm and bready. 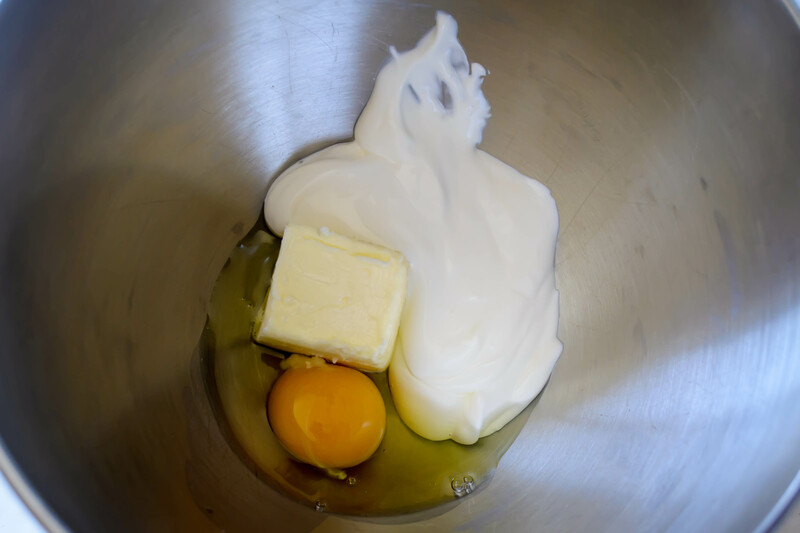 While you wait for the yeast, plonk the ¼ cup softened butter, the sour cream, the egg, and the vanilla into the bowl of a standing mixer (or into a large mixing bowl). Add the yeast and milk mixture to the combined wet ingredients and mix them together briefly using the paddle attachment, just enough to combine things and break up the egg (if you are not using a stand mixer, an electric handheld or some elbow grease and a whisk will do nicely here). Add the brown sugar, spices, salt, and 2 cups of flour. 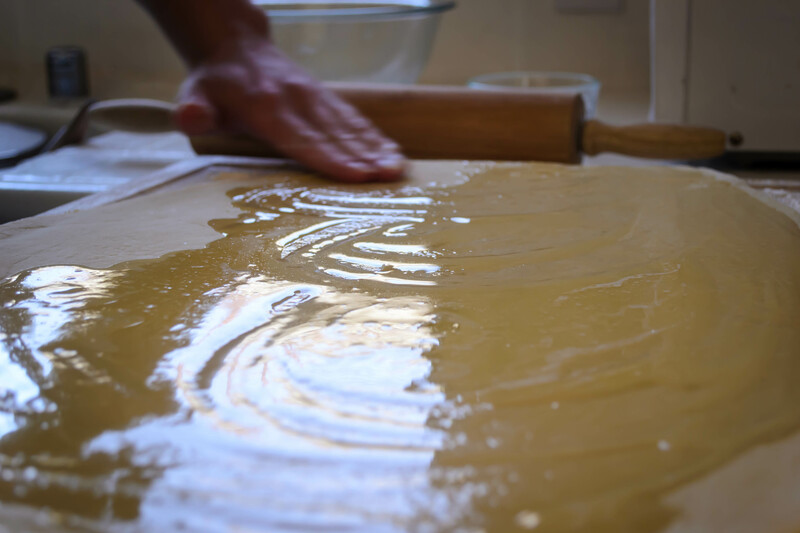 Using the paddle attachment (or a sturdy wooden spoon if you aren’t a stand mixer sort of person), mix just until the flour is moistened and you have created a lumpy dough. 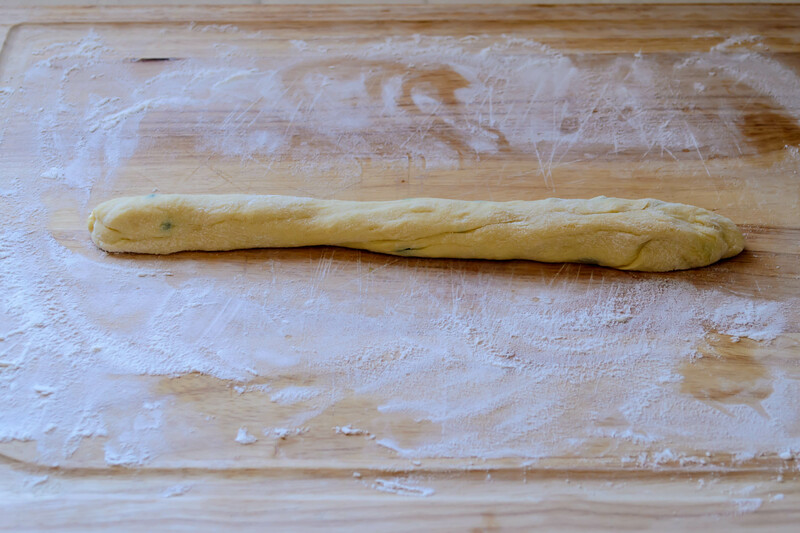 Switch to the dough hook (or turn your dough out onto a well floured board) and knead for 5-7 minutes. 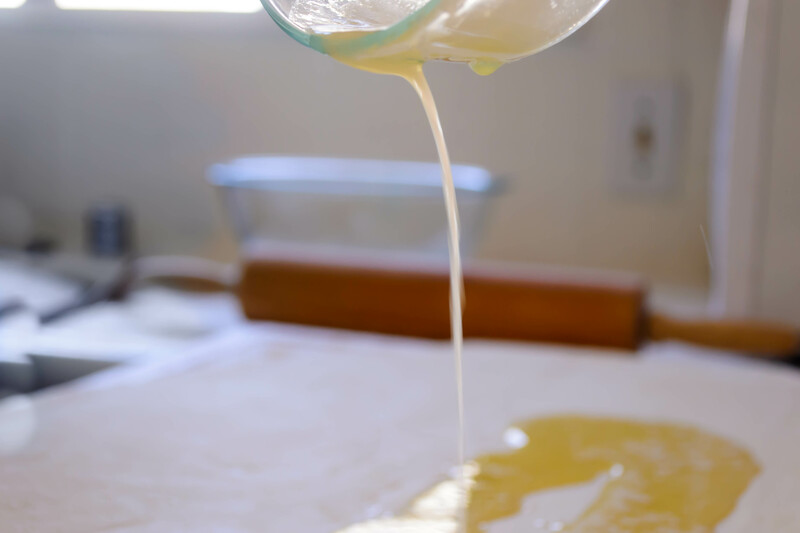 The dough will be very sticky – we’ve added a lot of fat and a lot of moisture. Don’t despair. Add more flour a tablespoon or two at a time just until the dough cooperates (up to 2 ½ cups of flour, though depending on the relative humidity of the day, you might not need that much). It will still be a bit sticky, but it will become more elastic and supple and much easier to work with. 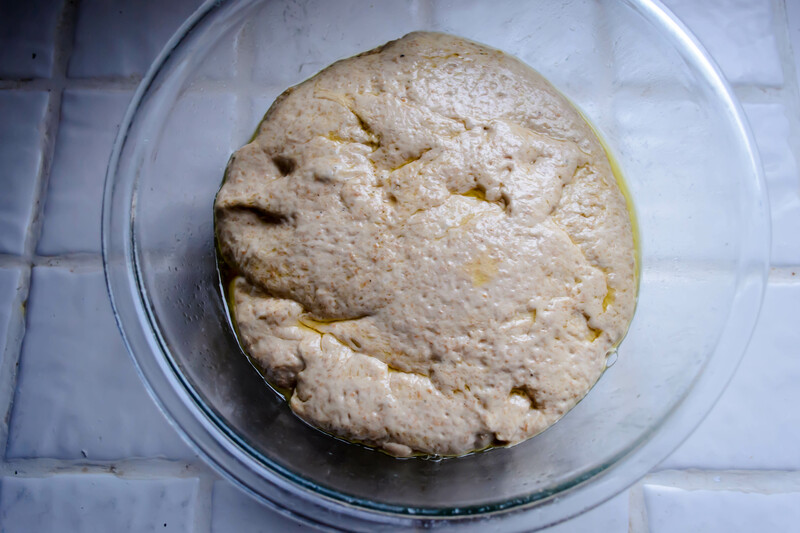 Once your dough is smooth and stretchy and a bit springy, plop it into a greased or oiled bowl, cover it with plastic wrap, and set it aside in a warm place to rise for 90 minutes, or until doubled. 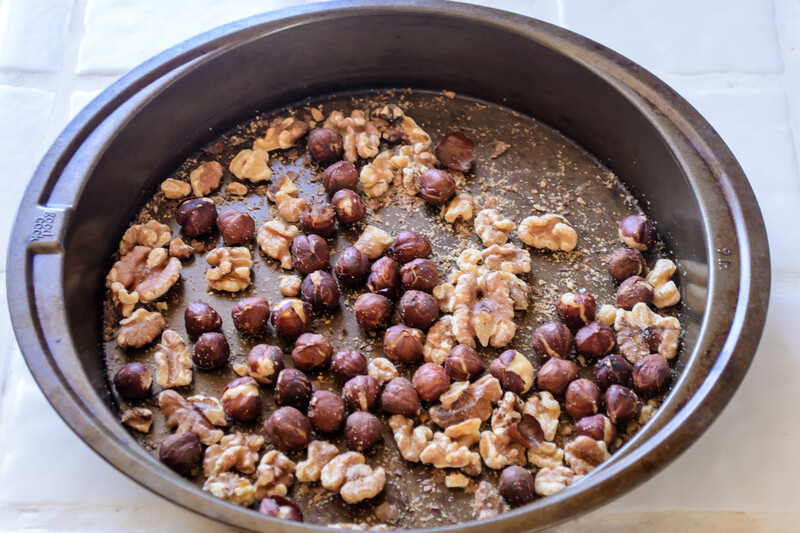 Meanwhile, prepare the filling: in a small bowl, combine toasted nuts, figs, brown sugar, and lemon zest, if using. Melt the ¼ cup butter to prepare for glossing the dough. Once doubled, punch down the dough to release trapped gas by gently deflating it with your fist. 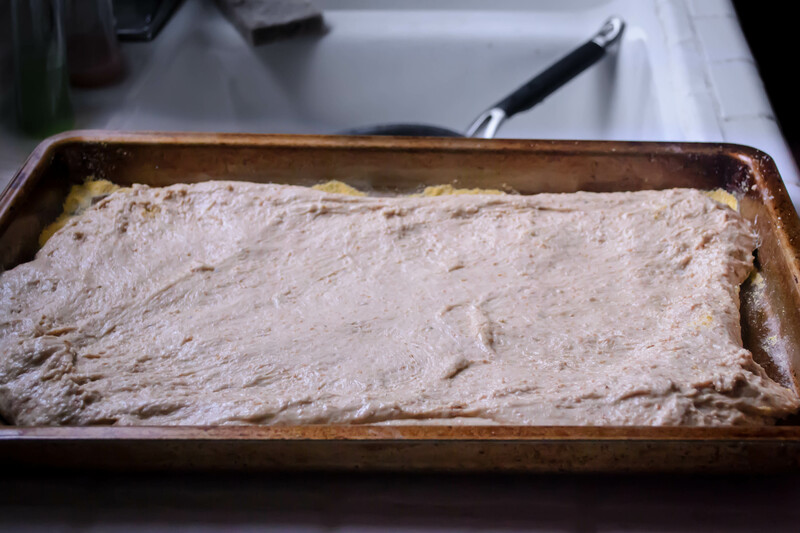 Turn it out onto a floured board and roll it into a rectangle the width of the long edge of your loaf pan and about twice as long. Now it’s time gloss the dough and add the filling. 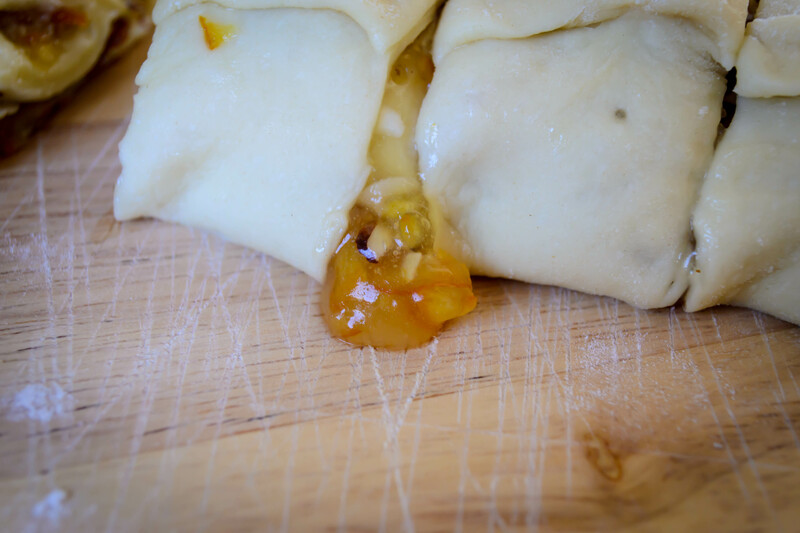 Dribble the melted butter over your rectangle of dough and rub it all over the surface, right out to the edges. I’m calling this “glossing” the dough because it leaves everything shiny and glossy and gleaming. You might have a little extra butter; save it for the topping. 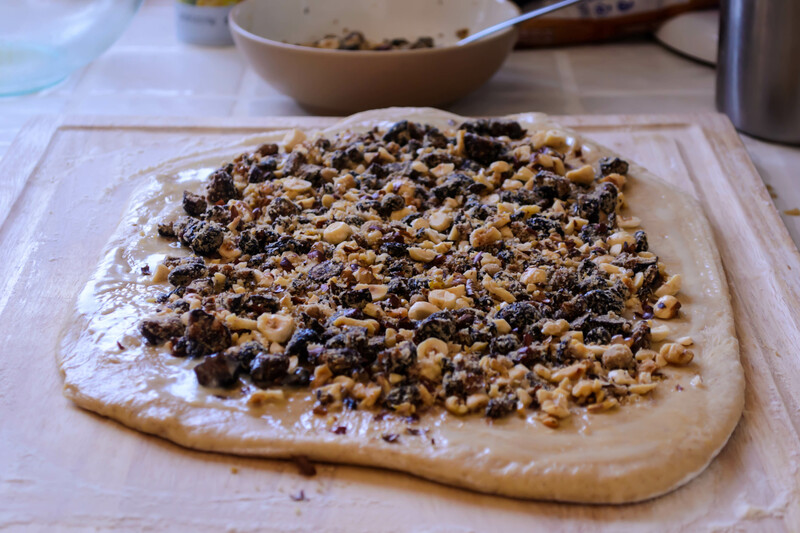 Sprinkle the dough with the fig and walnut mixture, leaving an inch or so border on all sides to prevent overflow. You will likely have extra. That is a most excellent thing because it goes so well with oatmeal or with Greek yogurt. Instant snack. 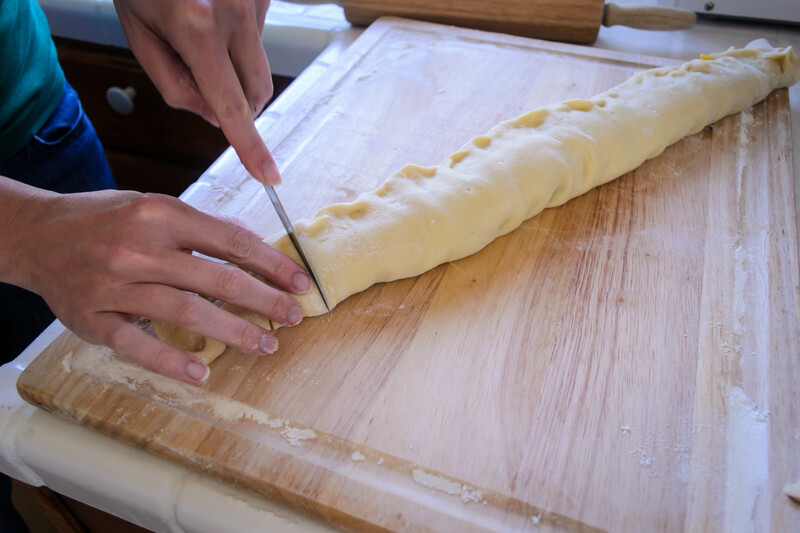 Starting on the shorter side of your rectangle (the side that is the same length as your loaf pan), begin to roll up the dough as you would for a jelly-roll, starting with the middle and moving out to the sides. 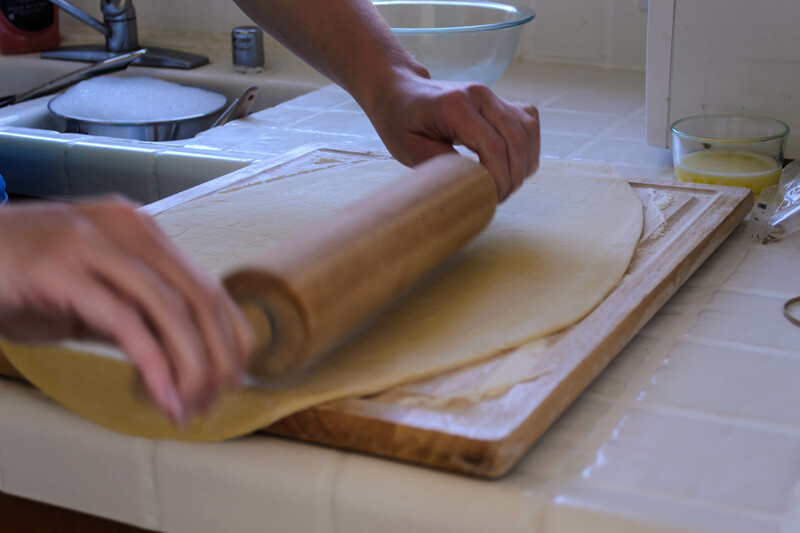 Continue rolling until all the filling is enclosed, and then fold up the remaining, bare edge and pinch it firmly against the roll to create a seam. 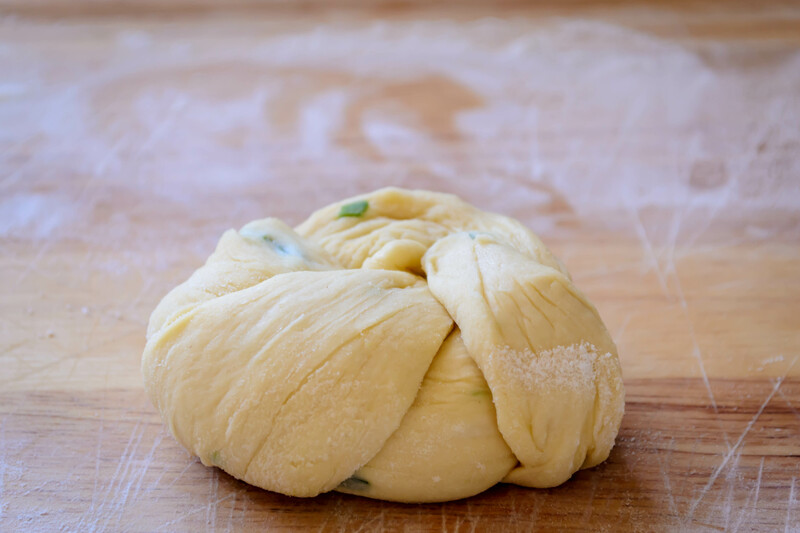 Twist your log of dough a few times to ensure that a pretty swirl of filling is formed as it bakes, then settle it into a buttered or greased loaf pan. Rub the top of the dough with soft or melted butter, then sprinkle it all over with the brown sugar and cinnamon. Cover it lightly with greased plastic wrap and set it aside to rise again for 30 minutes. During this second rise, preheat your oven to 375F. When the dough has had half an hour to collect itself, remove the plastic wrap and bake it for 35 minutes, or until the bottom sounds hollow when thumped or the internal temperature is between 180-200F (the thump test is the standard way of checking for doneness on bread, but it seems sort of impossible when you are baking a big loaf in a loaf pan. I prefer to take its temperature). Slice and consume. 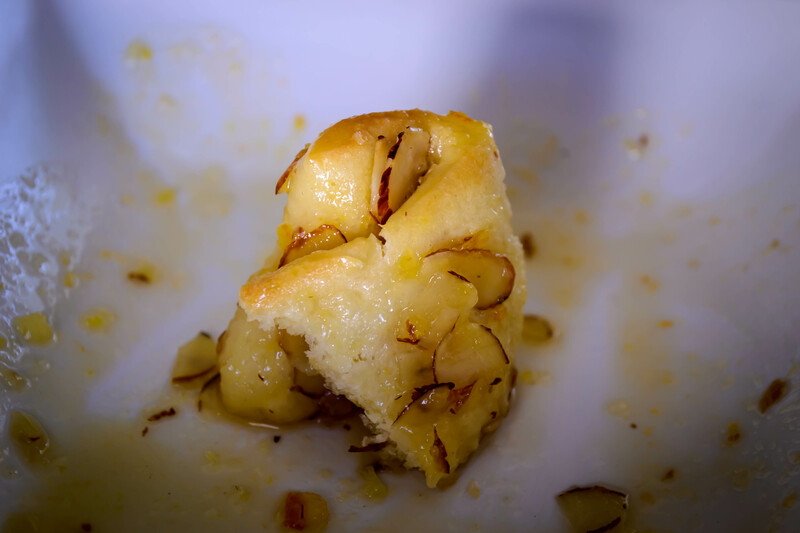 The filling can be a bit crumbly, so we ate it with forks like a slice of yeasted coffeecake. Enjoy! Last week I presented you with something both vegan and gluten-free. Dietary allergen-buster, that’s me! This week, to prove that I’m a fickle equal opportunist flexible sort of cook, I’m giving you something that is neither. But really, this is the kind of food person I am, and I’ve been thinking about this lately, especially given this post from Shauna at Gluten-Free Girl. I’ve thought, over this past year as I finished my Bittman Project and moved on to my exploration of dough, what kind of food blog this is, anyway. I don’t follow a specific dietary regimen. I don’t cook – or eat – specifically one type of food. So what am I? As I wrote to Shauna, what drove me to her blog, and what drove me to one of my own, was the expression of joy through food. I want food that tastes good and brings joy. And then, because it has given joy to the tongues and teeth and bellies of the people I made it for, I want to pass that on to people who weren’t in our little house with us. That’s you, people. So I guess what it comes down to is: this is a blog about food that brings you joy. At least, that’s what I hope you feel when you read, and when you eat, if you end up using the recipes here (and if you do, will you tell me? I’d love to know what you guys think). These little rolls brought us considerable joy. 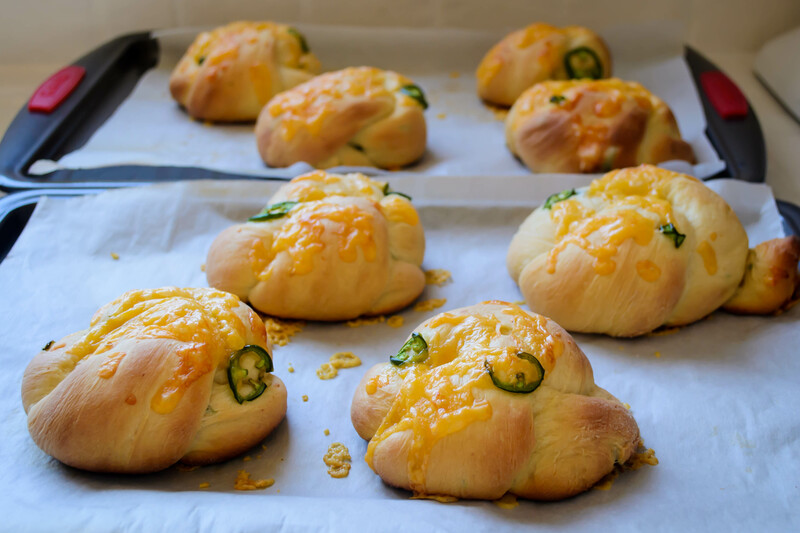 They are cheddar infused, jalapeño studded puffs somewhere in between a rich, buttery brioche and a stern, crusty, segmented Kaiser roll. They are also, given this month’s Twelve Loaves assignment of buns, the perfect choice to slice equatorially, layer with mayonnaise or hot sauce or pickles or onion rings or dripping fresh tomato slices and then cram with a burger of your favorite juicy variety. 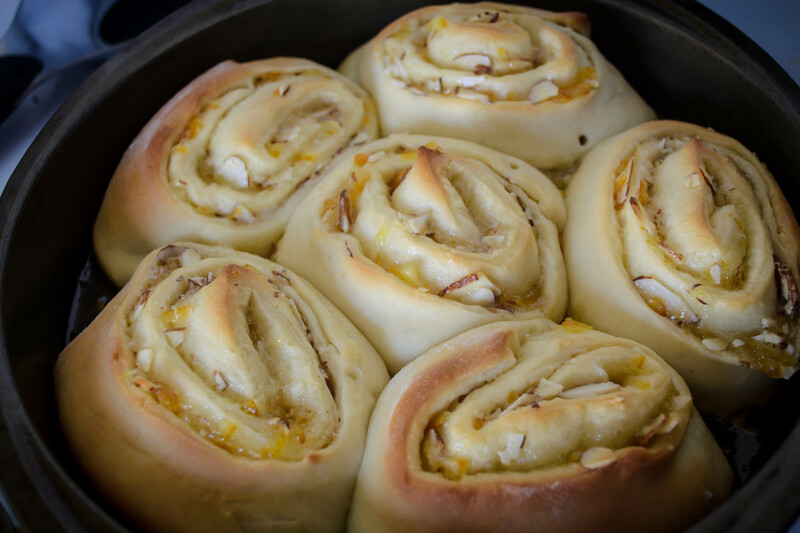 I started with my Nana’s sweet roll dough, replacing the sugar with a smaller amount of honey, opting for the tang of buttermilk rather than the roundness of whole milk, and injecting wafer-thin slices of jalapeno and cheddar cheese so sharp it made me – let’s not lie – basically drool when I sampled some. Though you could just divide your dough into equal sections and let these rise into sweet, uncomplicated burger buns, I decided to take on the familiar lobed shape of a Kaiser roll. This is, as you might expect, not the most straightforward approach, mostly because there are numerous methods for achieving that instantly recognizable shape. You can score the dough as it rises, you can use a special press that creates the petal shape, can follow a complex procedure of folds, or, as I learned and executed to my delight, you can roll the dough into ropes, tie them in a simple overhand knot, and then tuck up the ends. 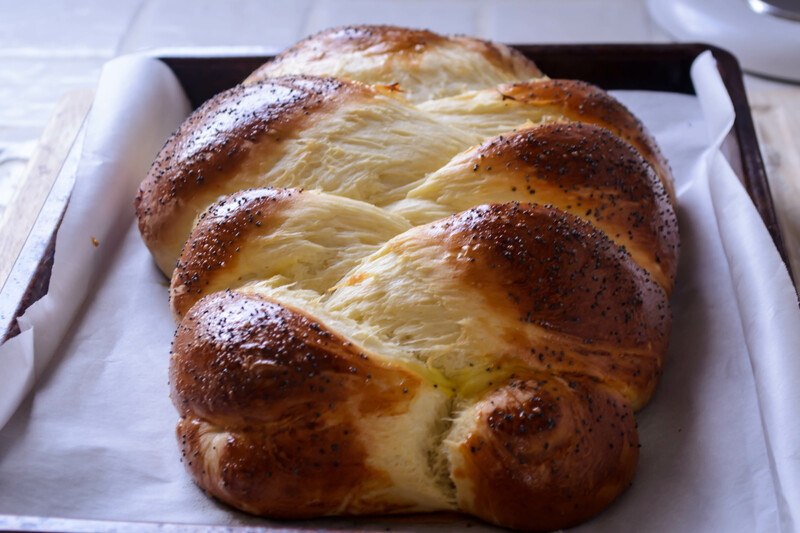 I’ve attempted instructions and accompanying pictures below, but if you are lost, try this recipe, which explains the knotting and tucking process pretty clearly. Sprinkled with more sharp cheddar and topped with a few more, probably gratuitous slices of pepper (you have to know what you’re in for, I think), these bake into all but perfect imitations of the jalapeño cheese rolls N. and I used to buy from Market of Choice as the occasional treat after a perfect sunny afternoon trip to the dog park in Eugene. We never put burgers on those, because they never made it through the whole ride home. 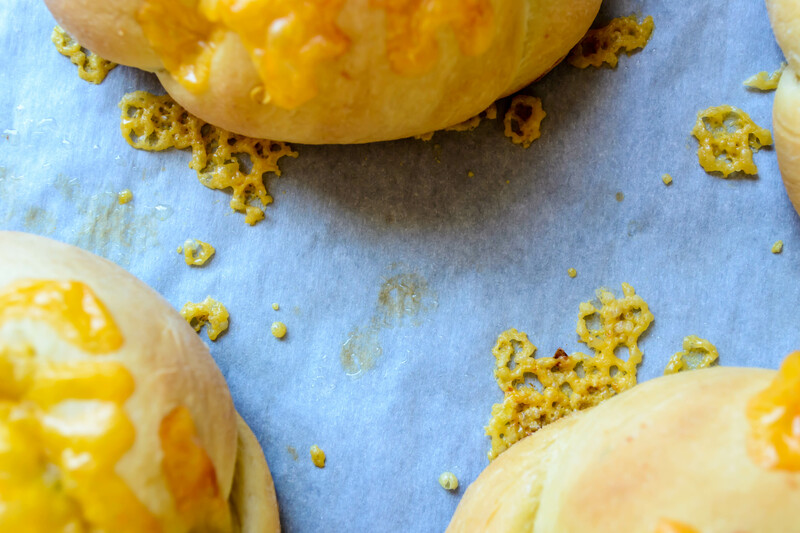 But these little Kaiser-roll-buns of mine, burnished with cheddar and lip-tingling with heat, will carry anything you load them with. Summer’s coming. That should bring you joy. If you can stand more, make these for your next barbeque. 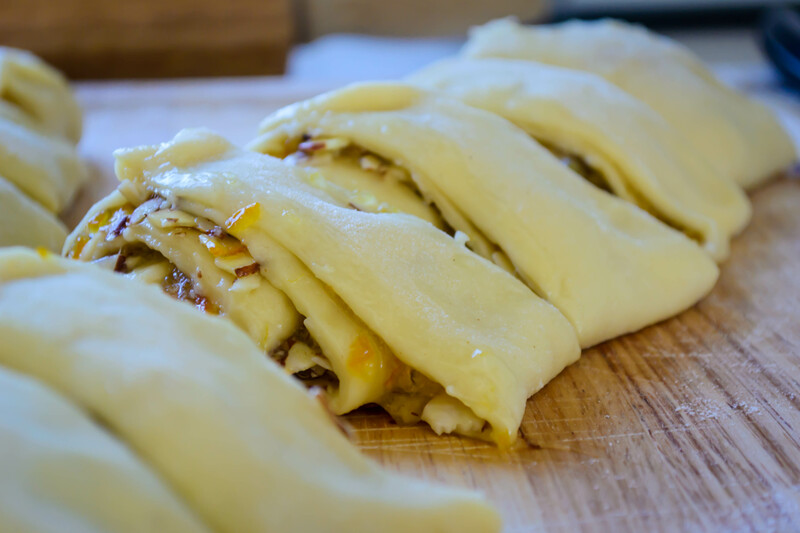 This recipe can easily be doubled, and once baked, these will keep in the fridge for a few days or, securely wrapped in airtight packaging, in the freezer for much longer. 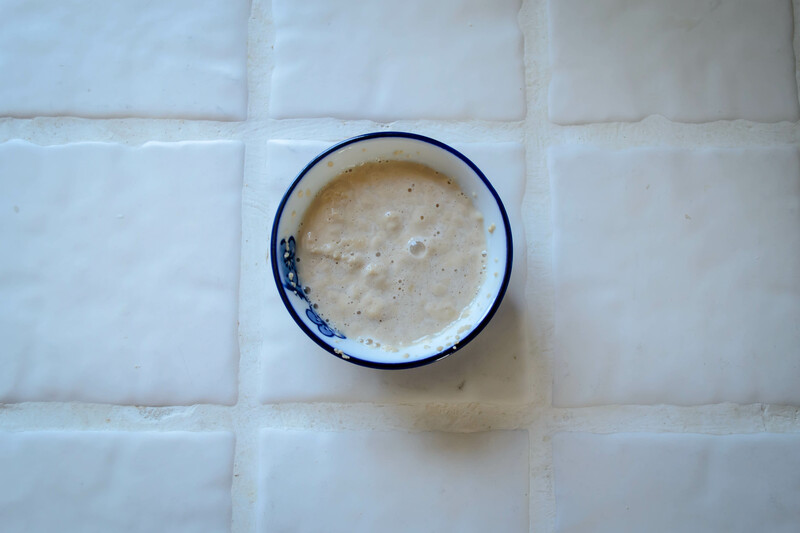 Stir the yeast gently into the warm water, set aside for five minutes to let the yeast wake up. Add butter and honey to the warm buttermilk, stirring them together until incorporated. This will make the honey and butter easier to integrate into the dough, and cool the buttermilk so it won’t kill the yeast or scramble the egg. 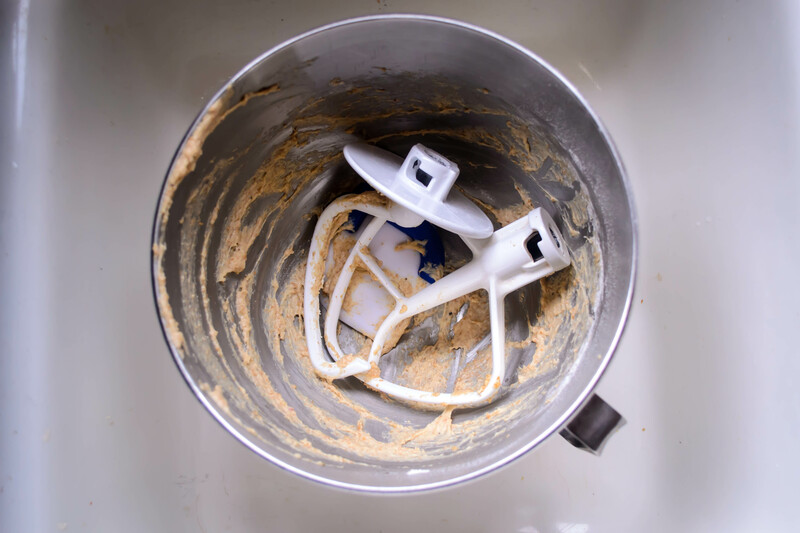 Pour the puffy, bready yeast, the buttermilk mixture, and the egg into a large bowl (I use the bowl of my electric stand mixer), and whisk or stir together with a wooden spoon or the paddle attachment of your stand mixer. Add the flour and salt to the mixture, and stir just until roughly combined. 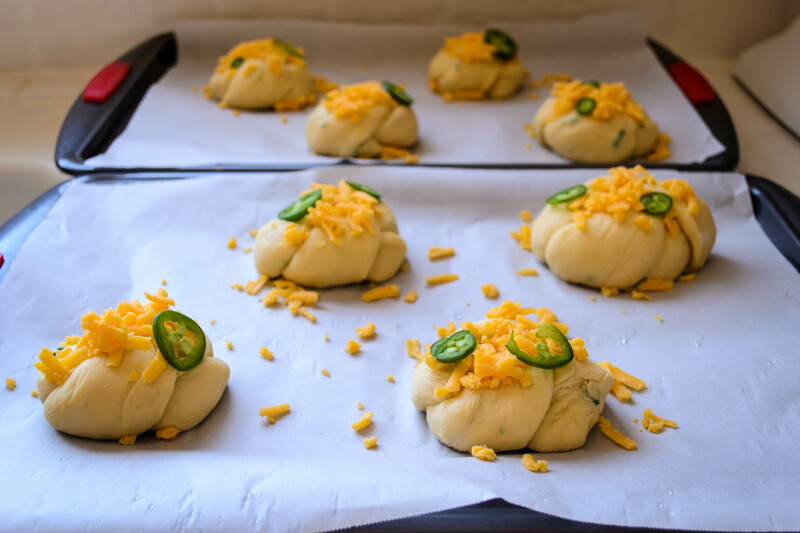 Add ¾ cup of the cheddar cheese and half of the jalapeño slices to the rough dough and stir again, just until the cheese and peppers are well distributed. If you are using a stand mixer, replace the paddle attachment with the dough hook and knead on medium speed for 8-10 minutes. 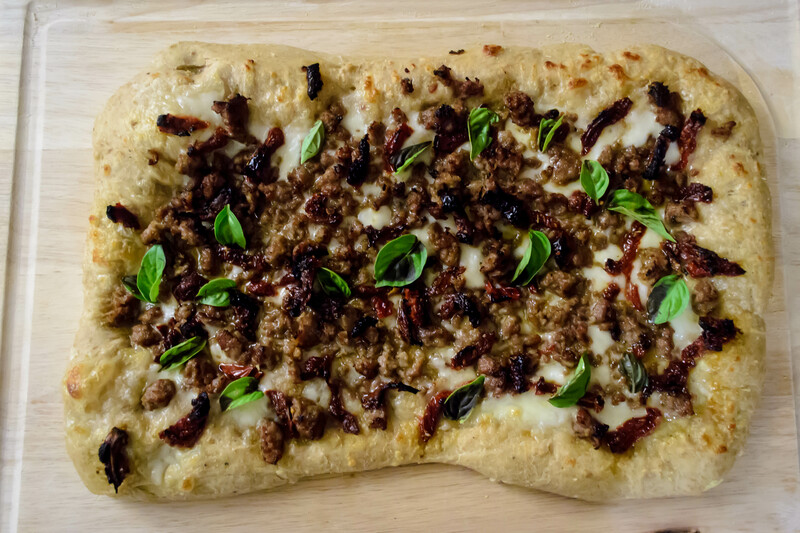 If you are not using a stand mixer, turn the dough out onto a floured board and knead by hand for about 10 minutes. Though I think kneading by hand will work fine here (I haven’t tried it, so I’m not positive), there are two things to take into consideration. 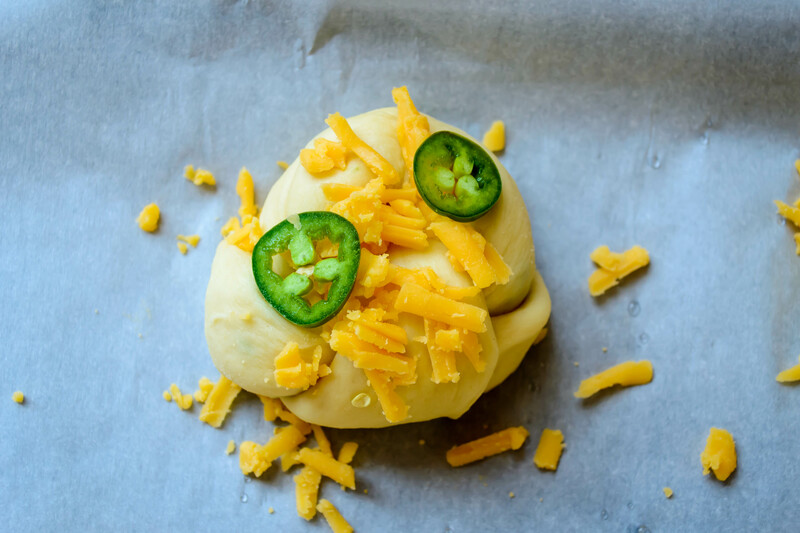 First, this dough has cheese it in, so that may make it messier to work with than your average burger bun dough. Second, it contains jalapeño peppers, which can leach capsaicin onto your hands and sting delicate skin (read: don’t forget and wipe your nose! ), so be absolutely certain you wash your hands really well after handling this dough. In either case, the dough starts out sticky, but becomes smooth and stretchy as you continue to work it. 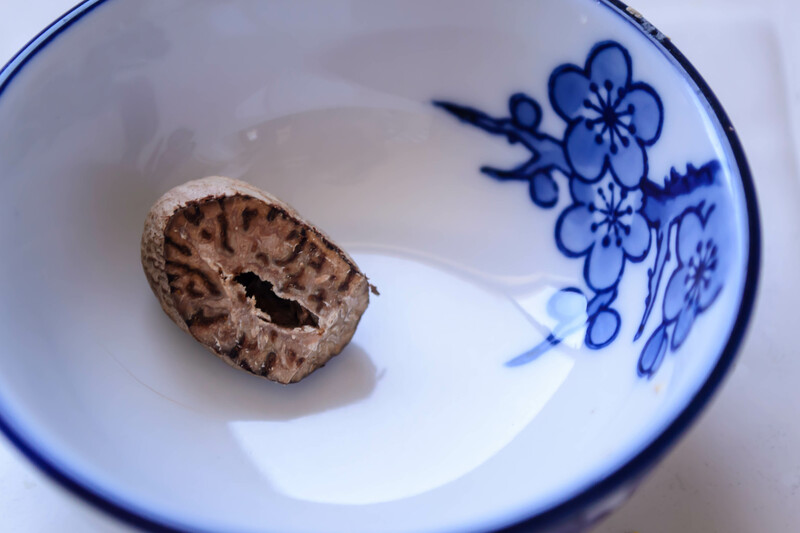 Once it is elastic and supple and lovely, place it in a lightly oiled bowl, cover with plastic wrap, and set aside in a warm room (if you have one handy) for an hour and a half, or until it has doubled in volume. 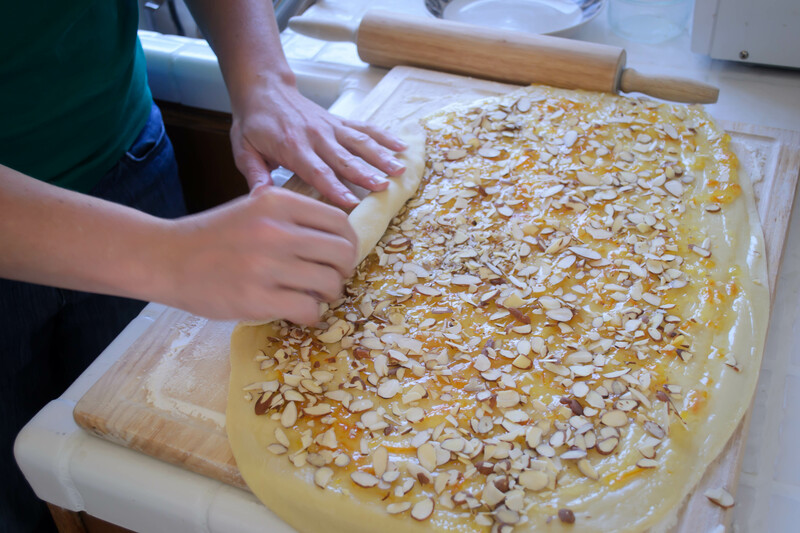 Remove the plastic wrap and punch down your doubled dough by gently but firmly pressing your fist into the center. It will almost gasp as the built-up gasses are released. 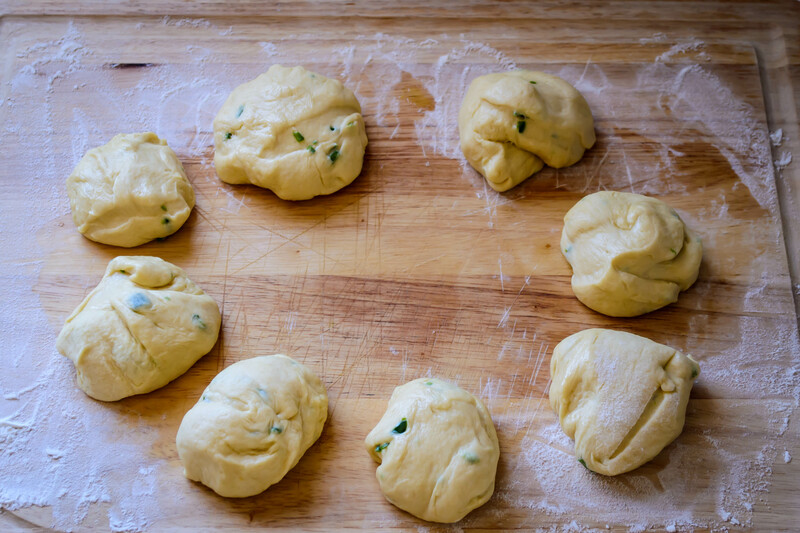 Divide the dough in 8 equal pieces (for petite buns), or 6 equal pieces (for big, beefy buns). Now would be a good time to do some prep, while the dough-balls get some breath back. Preheat your oven to 350F. Line two baking sheets with parchment paper. 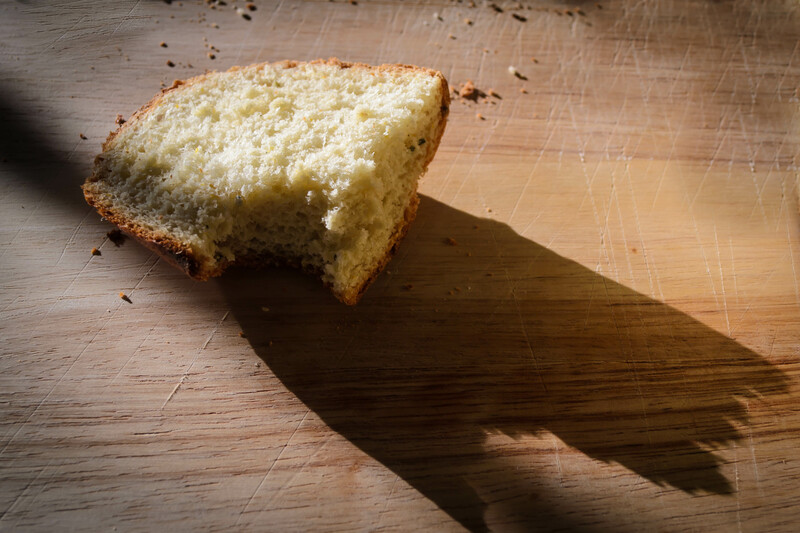 If you haven’t already, dust a bread board with flour. 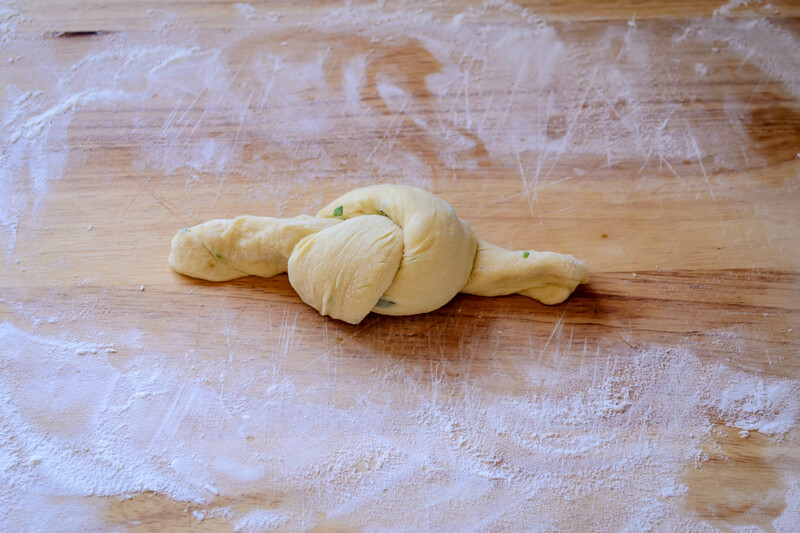 Working one at a time, roll each dough ball into a 6-8 inch rope (Picture 1). Tie the rope into a simple overhand knot (the same way you would begin tying a shoelace). I tie mine left side through right side, probably because I am left-handed. If you are right-handed and you tie your knot the opposite way, reverse the L and R in the directions below. You will have a knot in the middle and some lanky excess on either side (picture 2). Now, to form the segmented shape of a Kaiser roll, lift the length on the right side of your knot (which started out as the left end of your original rope) and pull it up over the knot, shoving the end of it down into the middle of the knot itself and pressing lightly to secure (picture 3). Next, lift the left side and tuck it under the knot, pushing it up through the middle from the bottom. Sometimes it will poke through and make a little button in the top of the roll; sometimes it won’t. Either is okay (picture 4). 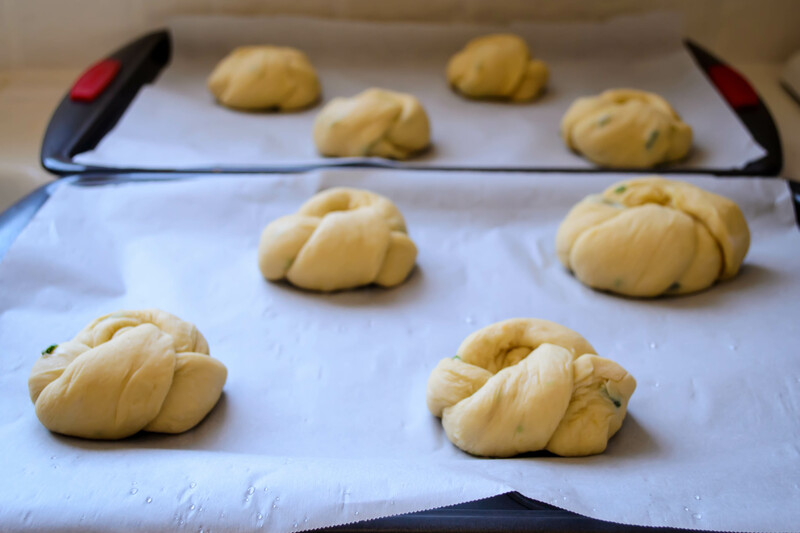 With all of your rolls knotted and tucked, set them on your prepared baking trays, spaced evenly. I did four per sheet tray. Sprinkle each roll with cheddar cheese from the remaining ¼ cup. Top each with 1-2 slices of reserved jalapeño. 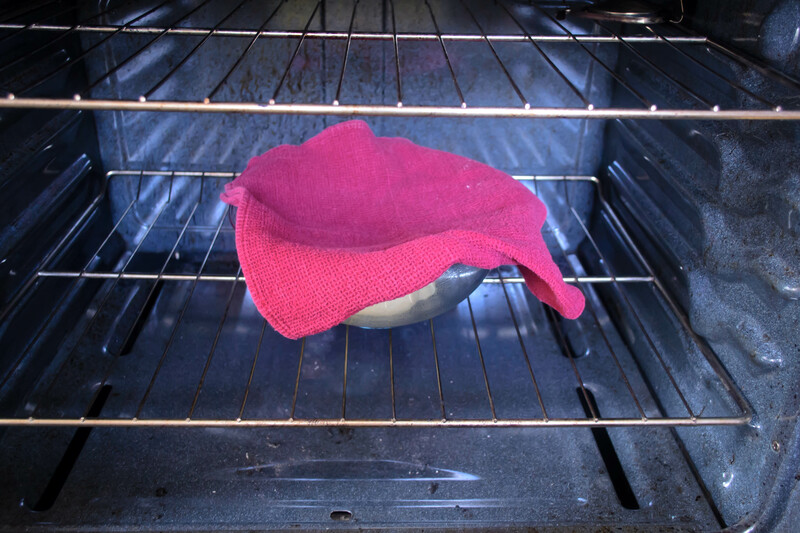 Cover trays with a clean kitchen towel and let rise for 30 minutes. Remove kitchen towel, admire the puffy little buns you’ve created, and bake in your preheated, 350F oven for 20 minutes. The cheese will melt, the dough will rise, the color will deepen to a lovely golden brown, and the thinnest of your jalapeño slices will barely begin to caramelize. If you eat these immediately, you will burn your mouth. And it won’t just be the good burn from the jalapeño. So do what you can to let them cool a little, and then load them up, or just eat them plain. I think you’ll be happy either way. First, thank you. Thank you to you lovely people and the lovely way you responded to last week’s post about my sweet rolls and my Nana. Old friends, new friends, family, it warmed me to see your comments. I so appreciate you making yourselves known and sharing your own experiences and memories – I’m motivated to delve into more old family recipes and more new experiments. That probably sounds a little cheesy, but I mean it. So I suppose you could call this a thank you loaf. 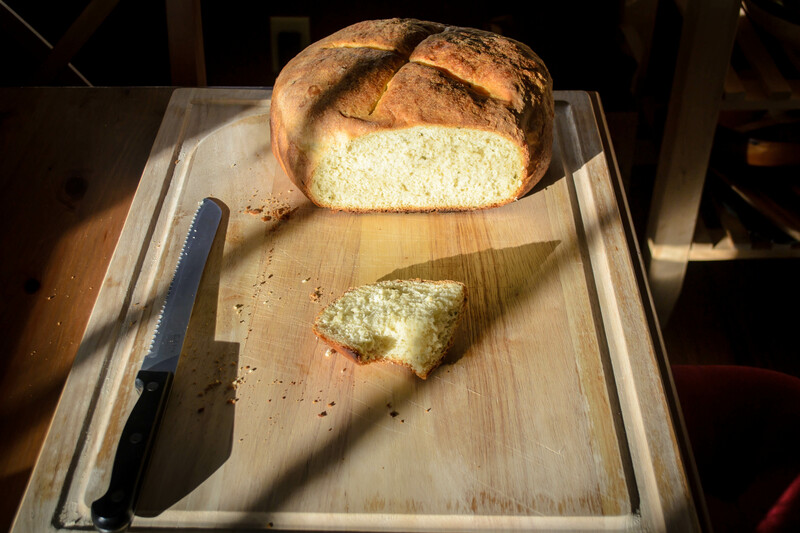 It was delicious, it was easy (well, as easy as baking bread can be, I suppose), and I made it for you. I wanted, as I’ve noted, a basic recipe, though I can’t resist adding a tweak or two to keep things interesting. My first boule was overbrowned; my second utilized an overnight leavening procedure I didn’t think added all that much to the final product. So the third had to be just right – the charm, you might say – and I really do think it was. Goldilocks bread. I went back to Ruhlman’s directions for cooking the loaf in a pot. This strategy for maintaining the shape and for holding in moisture by using a lid makes so much sense, and I wanted to give it another shot. This time I decided to add some fat to the bread in the form of olive oil. 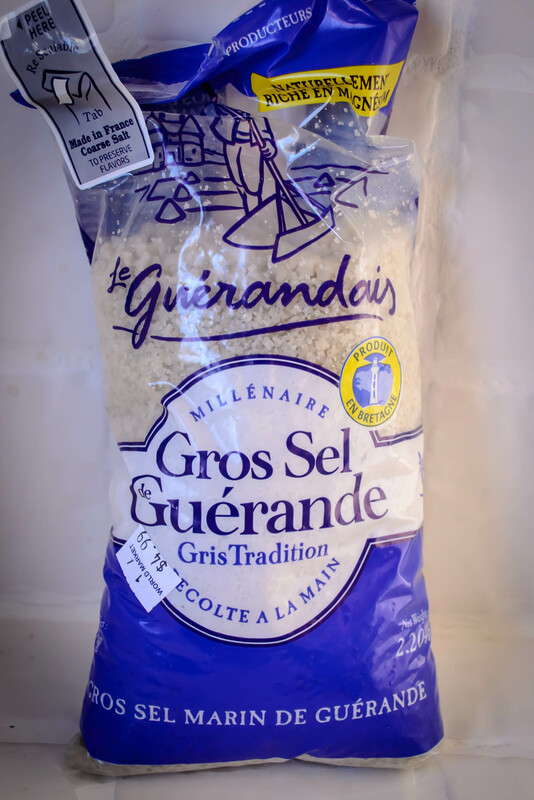 This made the crumb a bit moister and I think it kept the bread tasting fresh longer. To make the yeast extra happy, I proofed it (them? Is yeast grammatically plural?) with a few tablespoons of honey. This didn’t contribute noticeable sweetness to the final product, but it did make for an extra foamy yeast party. You could probably increase the honey if you wanted a sweeter end product. Since I was still on a high from the orange marmalade triumph, I decided this bread would benefit from some orange zest and, just for fun, some fresh rosemary too. I ended up with a really beautiful loaf: puffed, thin but crisp crust, moist dense crumb. The orange and rosemary creep up on you – perfumed subtlety lingering in the background until you’re almost finished chewing. Then they suddenly become present. It’s not a punch, it’s a slow sloping into flavor. 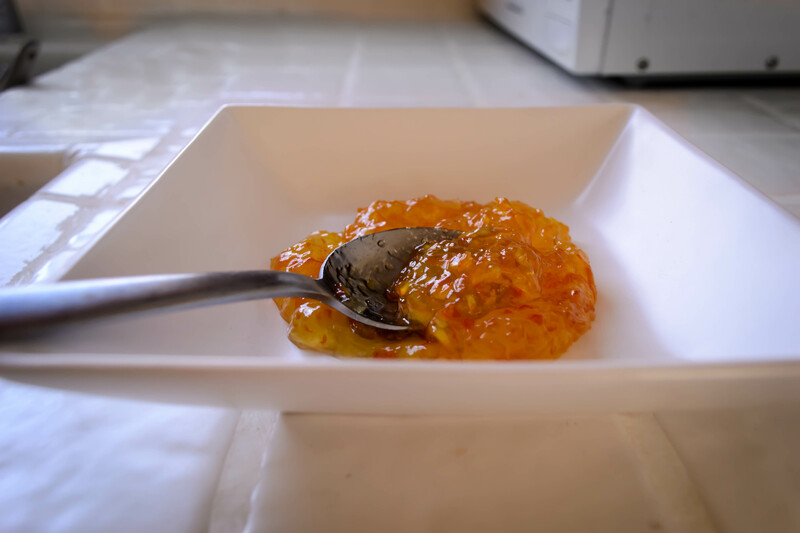 This was perfect for sopping up sauce from baked beans (it would make stellar toast for beans on toast), complementing the sweetness and the fatty bacon flavor with its subtle herbaceousness. 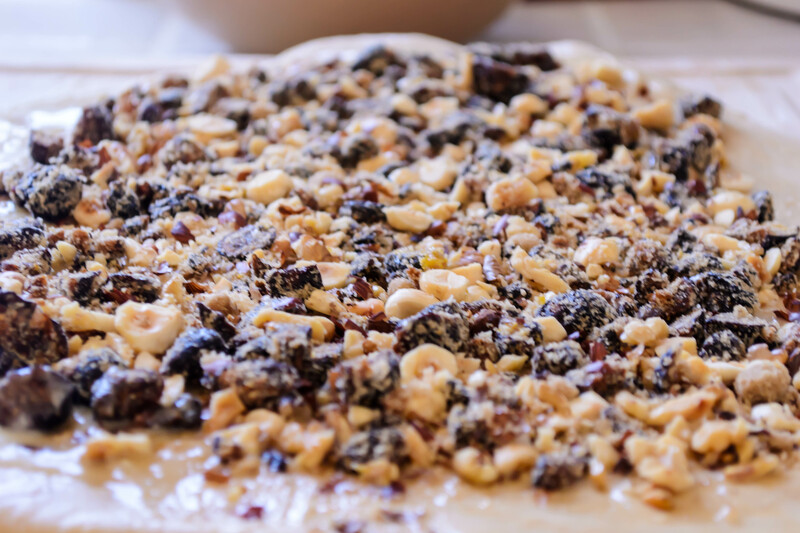 I could see adding some dried cranberries to the dough for a wintry take on a breakfast slice. It dances well with a slick of salted butter, plain and simple, but its shining moment this week was as an open faced sandwich spread thickly with cream cheese and fig preserves. The orange and rosemary played beautiful back-up to the cream cheese and the fig, and I bolted it before I even considered taking a photo to share the triumph. 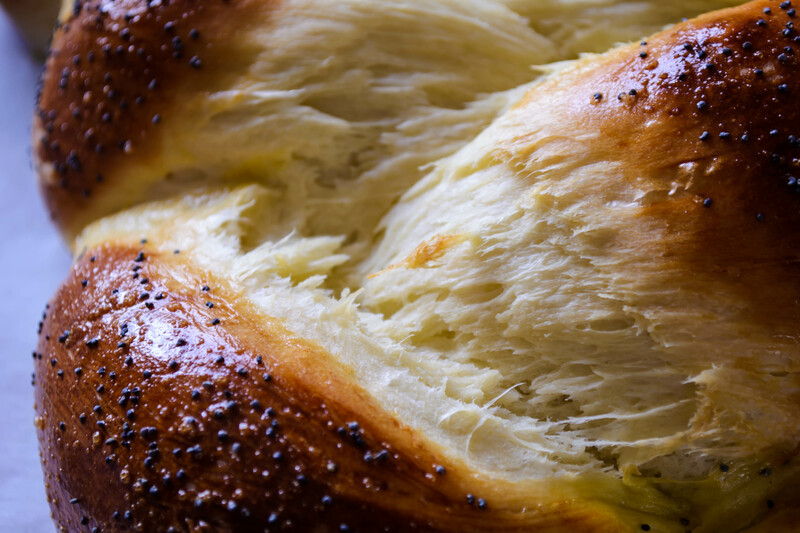 If you make this bread – and you should, oh you should – don’t miss this combination. 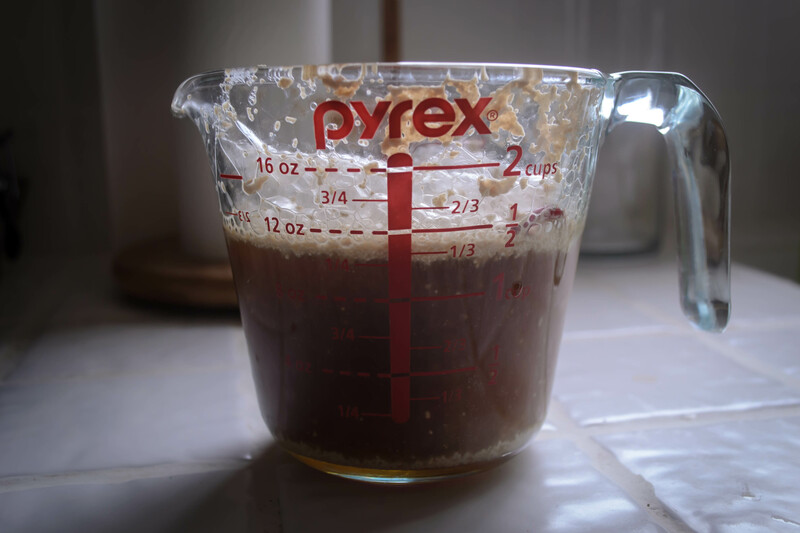 Combine the warm water, honey, and yeast in a small bowl or a measuring cup, and stir lightly. Set aside for 5 minutes or so to let the yeast revive from its hibernation. 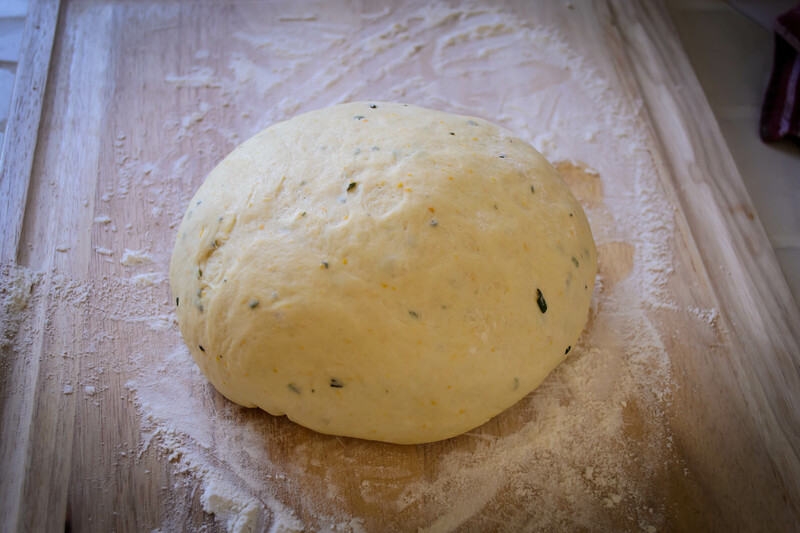 In a medium bowl (I use my stand mixer), combine the flour, salt, orange zest, and rosemary. When the yeast is bubbly and smells of bread and beer and awesome, add the olive oil to the wet mixture and stir lightly. 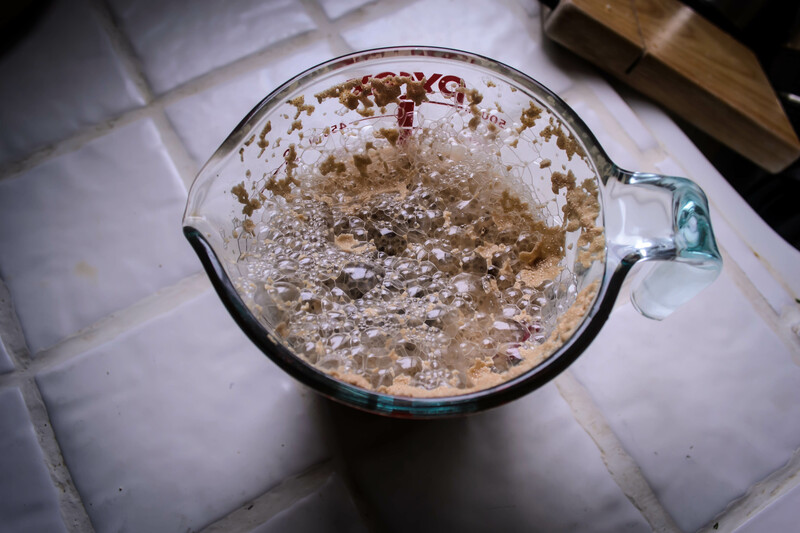 Pour the wet yeast mixture carefully into the dry ingredients, then stir to combine until you have a wet, shaggy mixture (if you are using a stand mixer, try the paddle attachment. I know it’s one extra thing to wash, but it brings the mixture together much more quickly than a dough hook). 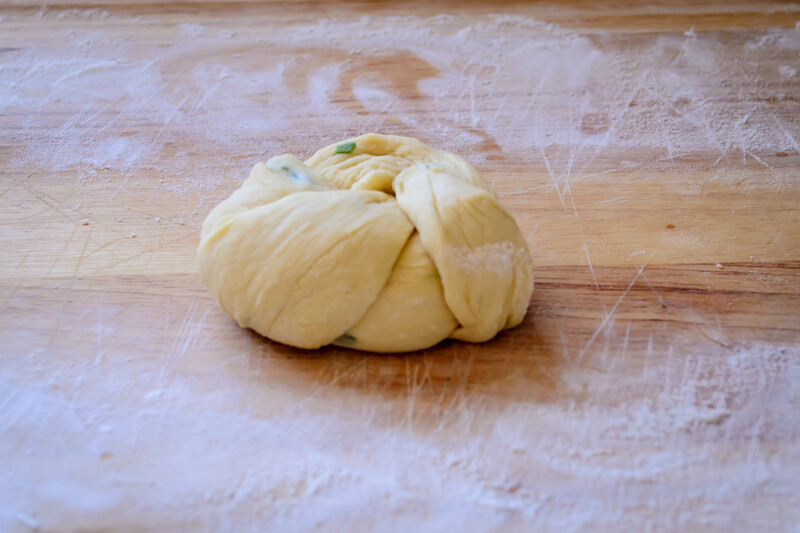 Once the dough is shaggy but workable, knead for 8-10 minutes or until a small knob can be stretched gently between your fingers to a point of translucency. This is called the windowpane test. 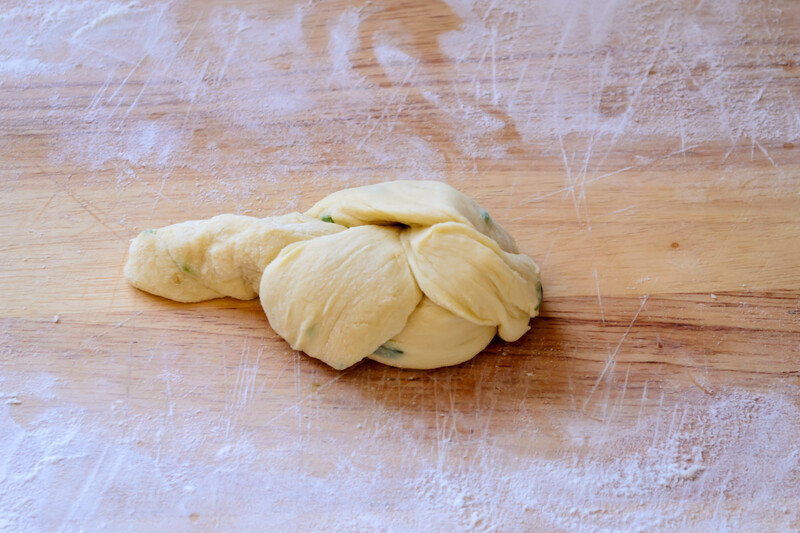 If you’re getting help from a stand mixer, use your dough hook and knead on medium speed, checking after 6-7 minutes. Your dough should be warm, elastic, and smooth. Turn it into an oiled bowl and flip it around until all sides are lightly oiled. Let it rise in a warm, draft-free environment until doubled, 60-75 minutes (My preferred method is to turn my oven on for five minutes, turn it off, wait for five minutes, and then put the dough inside. This creates an environment warm enough to help it rise, but not warm enough to start it cooking already). After the dough has doubled in bulk, push it down gently with your fist to release the gasses trapped inside, then let it rest for 10 minutes to get its breath back. 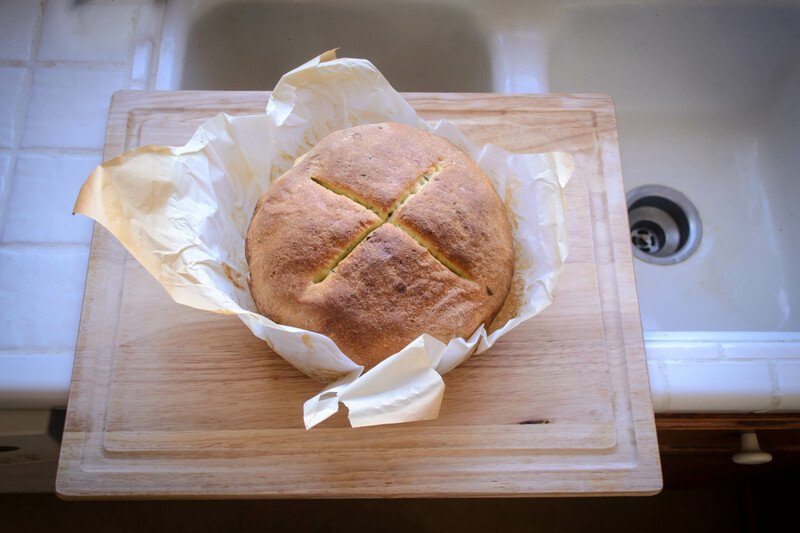 Transfer the loaf to a dutch oven or similar lidded pot and let it rise for another 90 minutes. I lined my baking vessel with parchment paper this time so I wouldn’t have to use olive oil, which I suspect made my previous attempt too brown on the bottom. This seemed to work fairly well. When your dough has risen again, it will be puffed and pushing against the sides of the pot. It’s now time to score it with a sharp knife, drizzle it with olive oil and sprinkle it with salt, then bake it with the lid on in a preheated 450F oven for 30 minutes. Keeping the lid on traps some of the moisture inside, so you don’t have to bother with flicking or spraying the inside of the oven, or even with adding a pan of water. 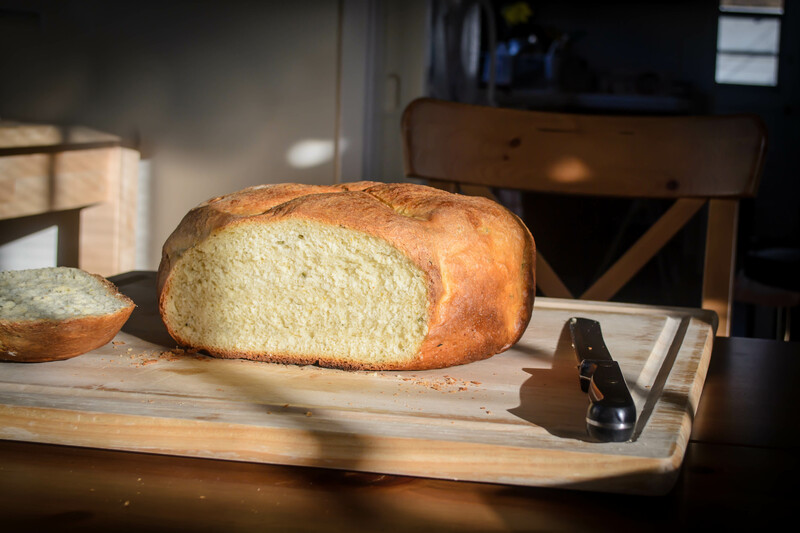 After half an hour, remove the lid and continue baking for 15-30 additional minutes, or until the bread is done (it should register 180-200F on an instant-read thermometer and sound hollow when you tap the bottom). Mine only took an additional 15 minutes before it tested done. Let the bread cool for 10-15 minutes, if you can stand it, before slicing. This gives the center time to cool a bit and helps it stay together better. Or, you know, just tear off chunks and eat them blisteringly hot. I won’t tell anyone. Guys, I’m pretty excited about this one. It’s a mile marker for me in a couple of ways. 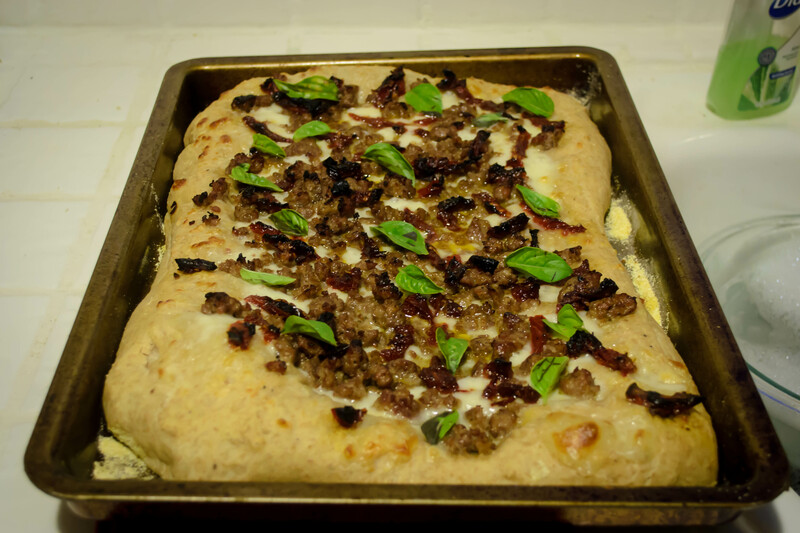 One, it’s a sweet application of yeast dough, which I’ve never tried before. Two, I’m well into the second month of this project and I haven’t had any true disasters yet or fallen off the horse, which buoys my confidence. Three, except for temperature and cooking time, which I had no idea about, I didn’t consult the internet a single time for clues about how to make this. But four, and unquestionably most important, this is an adaptation of one of my Nana’s recipes, and I made it successfully. Nana was a cook. She was an old-fashioned, from home, meat/starch/veg-that-sometimes-came-from-a-can kind of cook. She was a clean-your-plate-before-you-can-have-dessert and sometimes a there-are-starving-children-out-there kind of cook. But that was her era. She raised her three kids on three square meals a day plus cookies. She taught my two aunts how to cook, she cooked for our Pap almost up until the day he died, and she sent out a yearly box of Christmas cookies until I was almost through college. My freshman year I remember getting a slip in my mailbox that meant I had a package to pick up, and finding, after returning to my room and tearing at it feverishly, that it was filled with sweets. Chocolate dipped apricots, cream horns, which we called ladylocks, nut rolls, seven layer bars, pizzelle; these were how Nana sent us her love. I always meant to send one back to her, when I was “grown up.” It tugs at me a little that I never did. 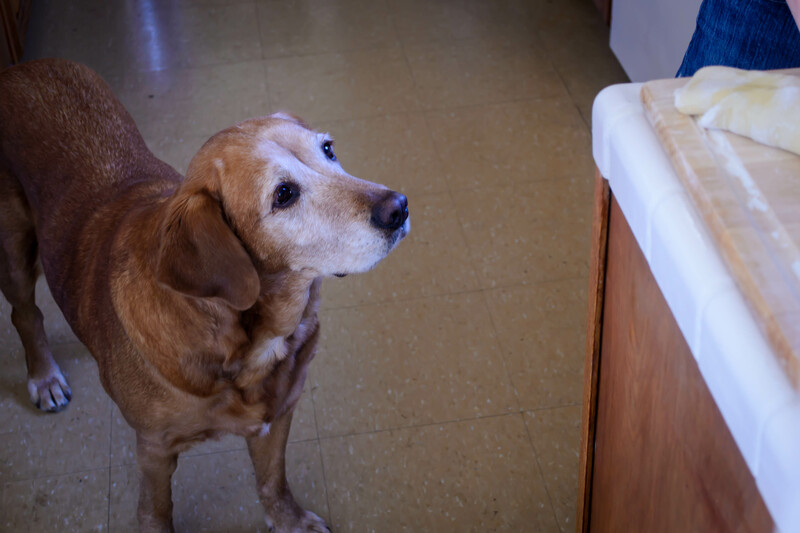 When she heard I was learning how to cook, she gave me my first cookbook: The Complete Guide to Country Cooking, along with a subscription to Taste of Home magazine. One summer when we came to visit, I offered to help with the menu and she told her friends her granddaughter was going to be her cook for the week. She said it was good, too. In 2007, when I was about to get married, I received a large red photo album from my female relatives, featuring favorite recipes from their own kitchens. Nana couldn’t attend my wedding – she was on oxygen and too weak for the plane ride across the country from Pennsylvania – but she had contributed recipes to this book, and even as I cherished her contributions I never thought I would make most of them myself: I was too inexperienced to try these dishes she had clearly mastered – lemon meringue pie and yeasted sweet dough were beyond my capabilities. But when I thought about cooking this past week, I thought about that stretch of dough from my dill bread and in its place saw cinnamon rolls. They are, after all, filled and constructed in a similar way. 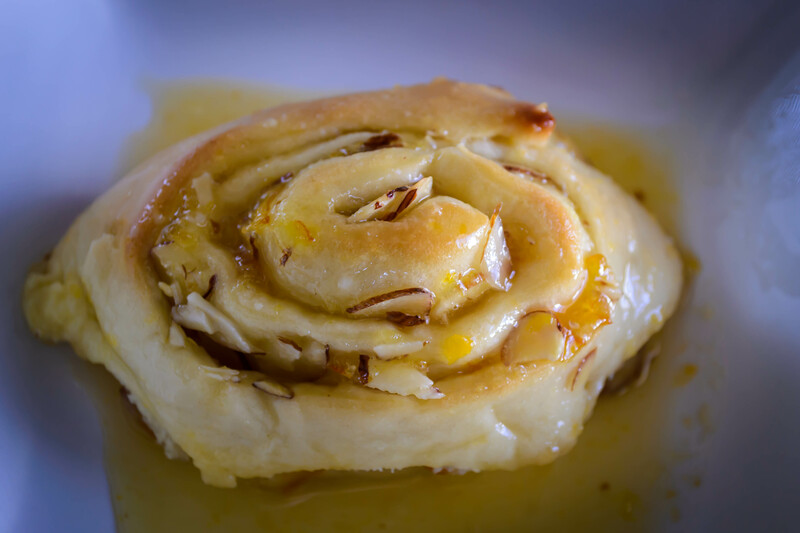 I love cinnamon rolls, but sometimes the dripping gush of cinnamon pooled in pounds of sugared butter is just too sweet for me. Orange marmalade came into my mind, and with it, almonds. They seemed like such a nice pairing, and as I wondered how to make them I found myself back in Nana’s section of my big red cookbook, staring at directions that now seemed less intimidating than they did six years ago. 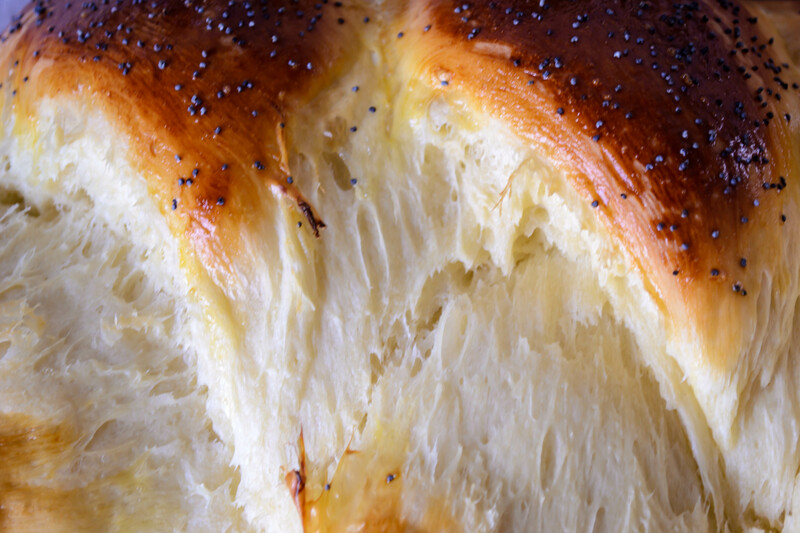 This is a beautiful, elastic, slightly sweet dough. 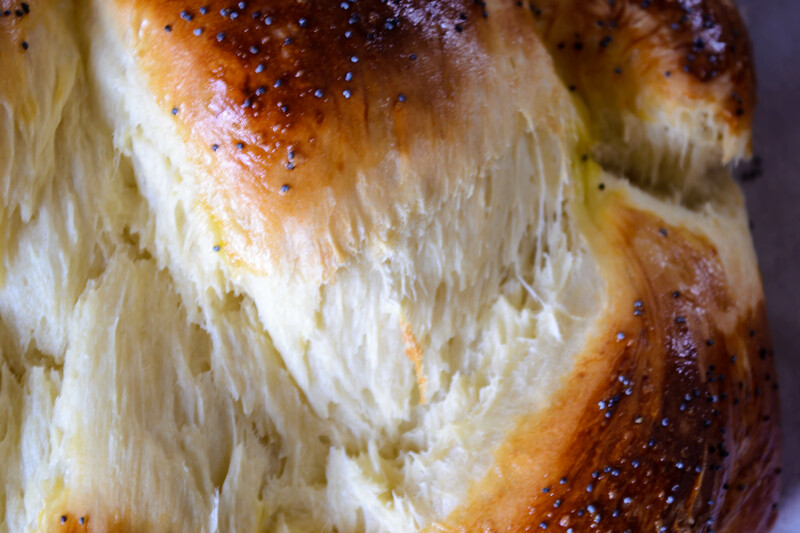 It is smooth and rich and expansive, and it makes a glorious roll. It sighs like a feather pillow when you punch it down. 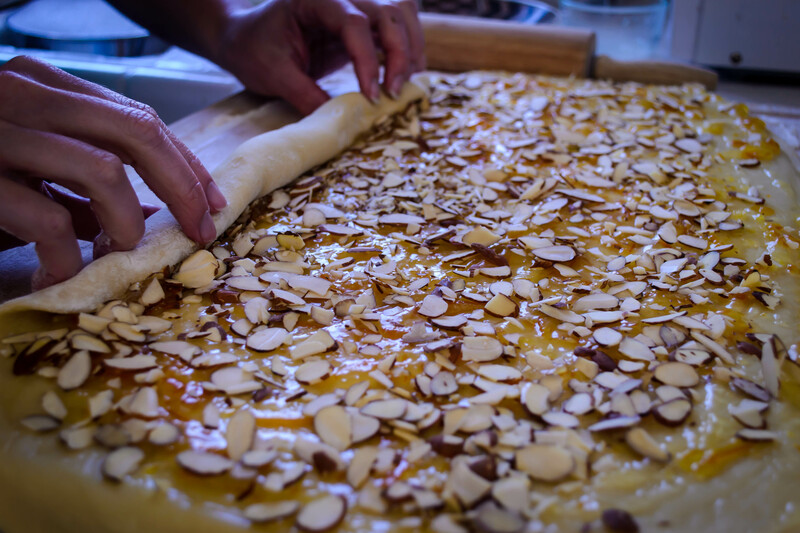 It wants very little from you – just a massage with melted butter, a liberal smear of marmalade and almonds, and gentle, careful rolling. 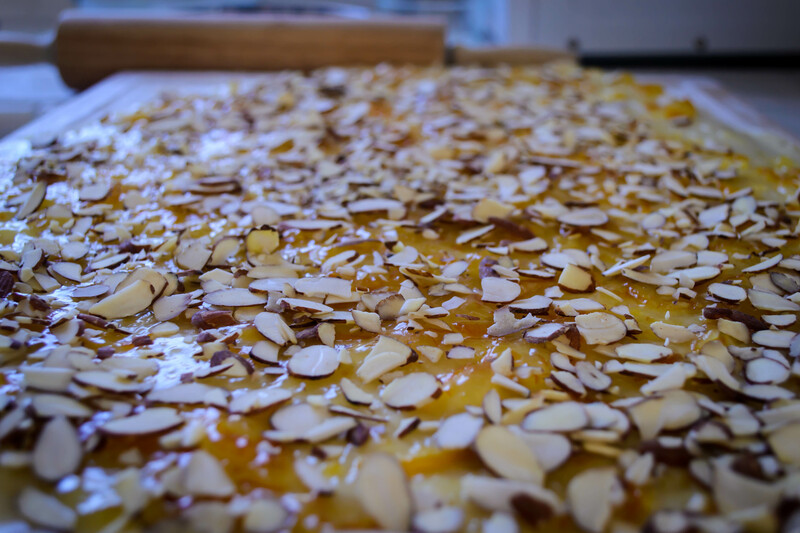 Inside, after baking, the orange and almond marry well, since the jammy part of the marmalade pools against the dough, but the zest and the almonds retain texture for the teeth to play with. I doused one pan with a glaze made from fresh orange juice and powdered sugar, but I think that overdid the sweetness factor a bit too much: the glaze tasted like liquified orange Pez. Better, I would say, would be a slick of soft cream cheese, perhaps whipped with a little brown sugar if you absolutely must. But plain, browned, warm out of the oven, and a little sticky with its own sweetness, is just perfect all by itself for breakfast, for dessert, for mid-morning snack. For any time that is right now, really. Thanks, Nana. In the bottom of your mixing bowl, combine the yeast and water and stir gently. Let it sit for at least 5 minutes so the yeast wakes up a bit. Meanwhile, heat your milk, then cool it down. You can hasten the cooling process if you forgot to soften your butter: just drop the still-cold stick right into your warm milk and swirl. You’ll cool the milk and soften the butter simultaneously. 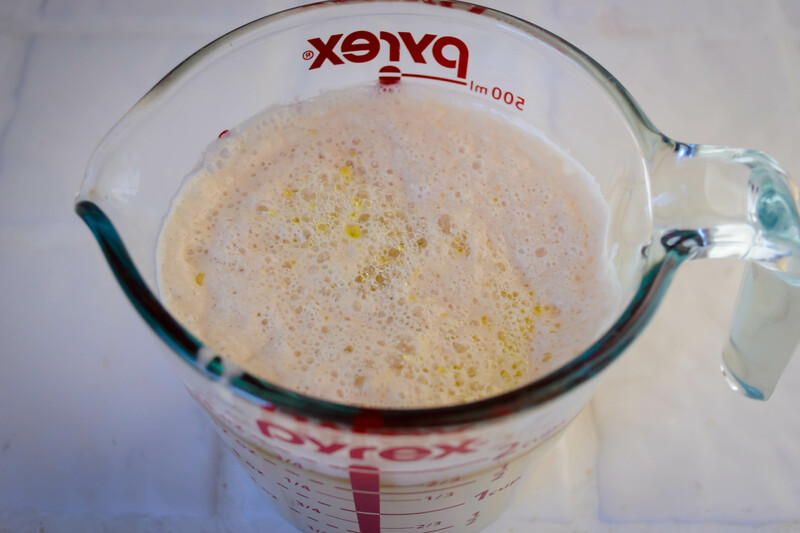 When the yeast bubbles and smells bready, add the cooled milk, softened or melted butter, sugar, and egg. Stir to combine. When the mixture has homogenized a bit, add 1 cup of the flour and the salt and stir again. You will have a soggy, unworkable mixture. Continue to add the flour ¼ cup at a time, stirring after each addition (if you are using a stand mixer, use the paddle attachment and just keep it on low speed until things come together). 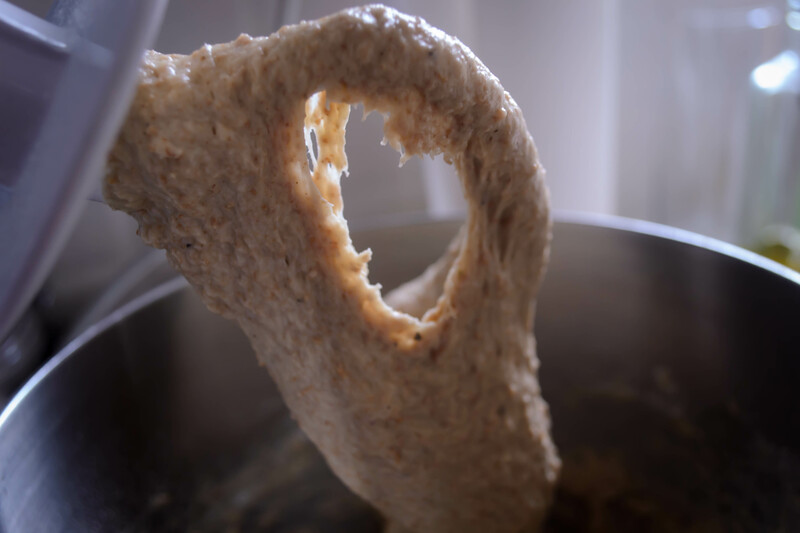 When it starts to look like bread dough – pieces begin to have that floured, torn texture and hold together – and becomes just workable, don’t add any more flour to the mix. 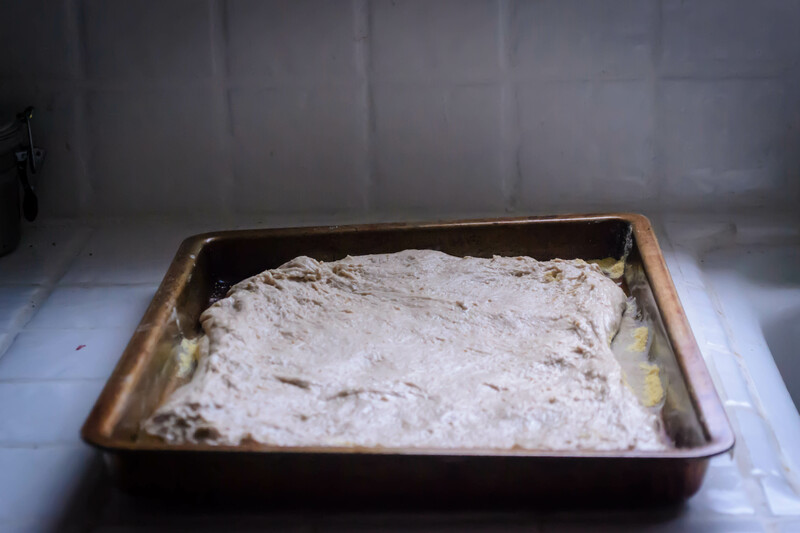 Switch to your dough hook or a well floured board, and knead until smooth and elastic, about 5 minutes. 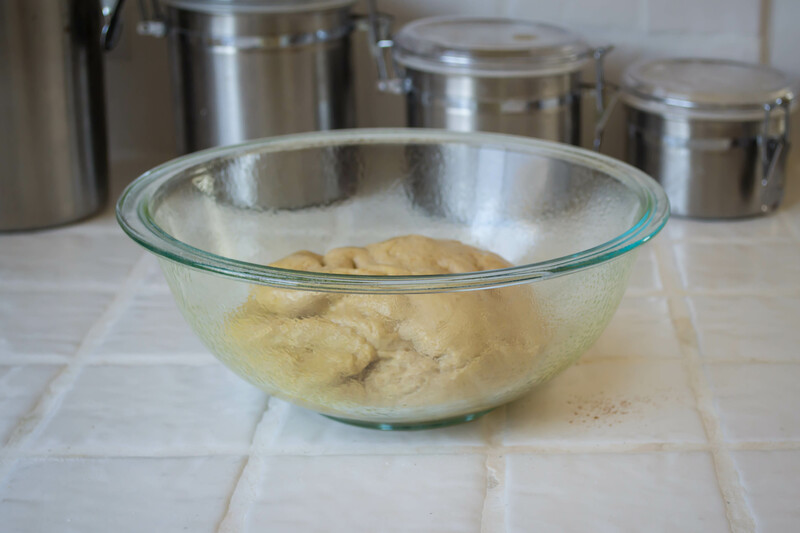 Once kneaded, put your shiny, smooth ball of dough in a lightly greased bowl and roll it over so all sides are moistened by the oil. Let it rise in a warm place until it doubles – at least an hour and a half. 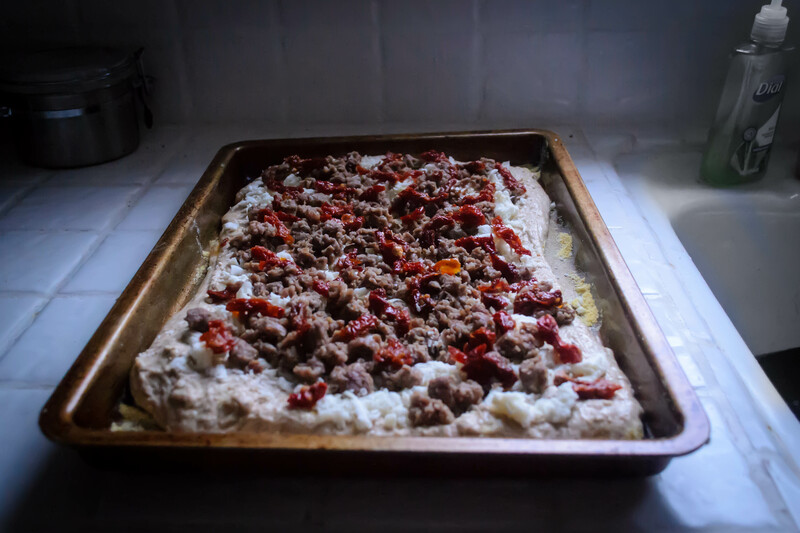 I like to heat my oven to 200F (my lowest setting) for a few minutes, then turn it off and let it cool for another few minutes before stowing my dough inside. When the dough is ready, it will have doubled in size, and the bottom will be covered with puffy little bubbles like the ones that let you know your pancake is ready to flip. Punch it down by pushing your fist gently into the middle to let the gas escape. 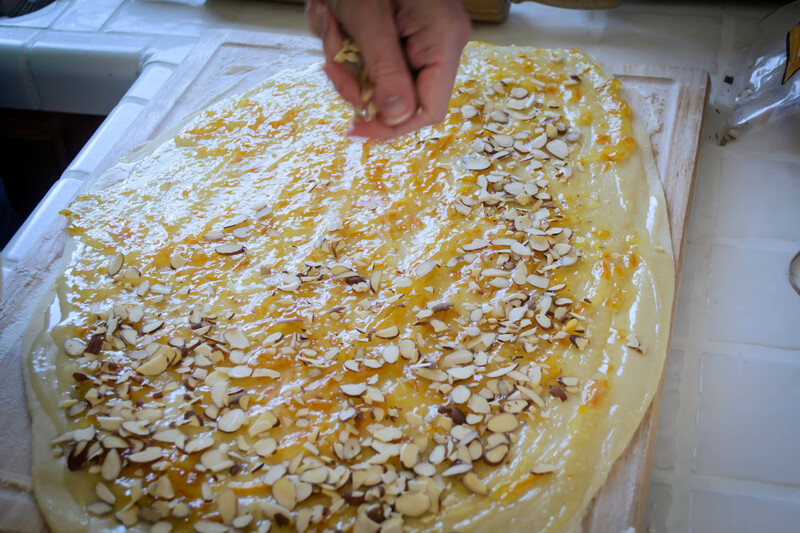 Turn it out onto a floured board and roll gently, forming a rectangle of probably 2 feet by 3 feet. Maybe 3 by 3, if it seems willing. It should be ¼ – ½ inch all the way around. My board was, clearly, a bit on the small side for this undertaking. 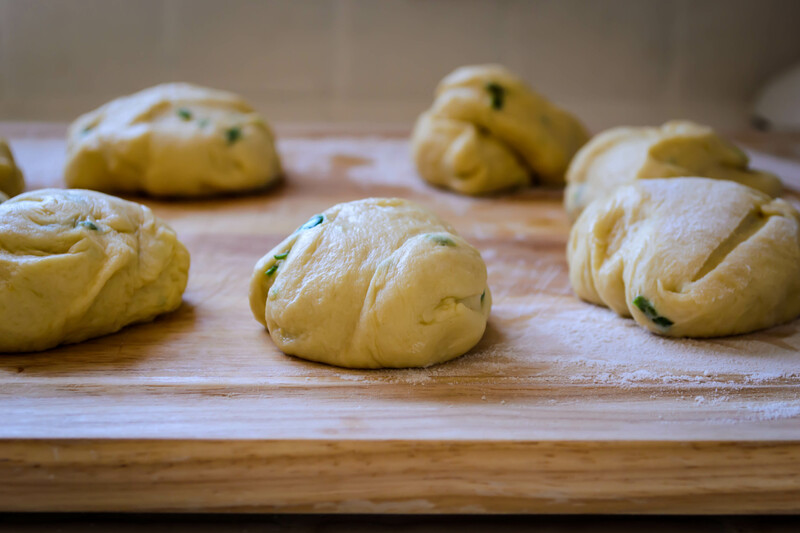 Give your layer of dough a massage with the ¼ cup melted butter, spreading it evenly over the surface until it’s gleaming, but leaving an inch or so margin around the edges. This will help prevent spillage of the inevitable ooze when you start rolling. 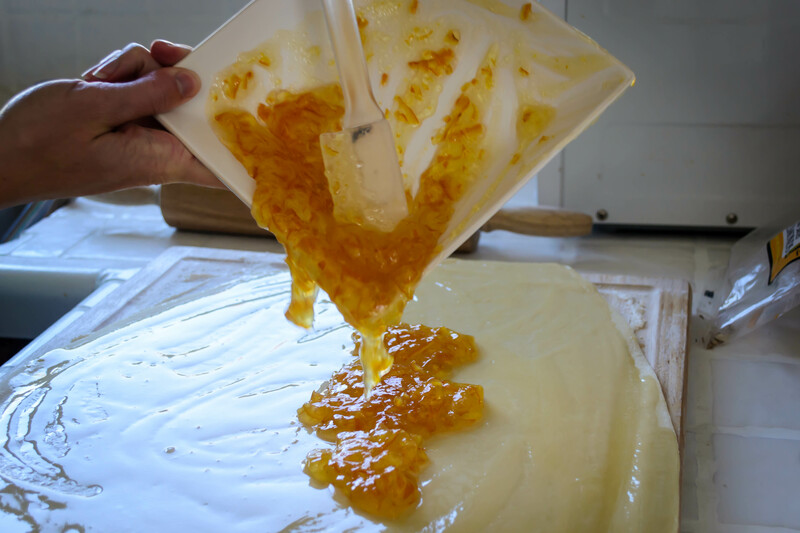 Spread the warmed marmalade over the buttered dough, again respecting the inch margin. Warming it up by microwaving it for just 30 seconds or so helps it spread more evenly. 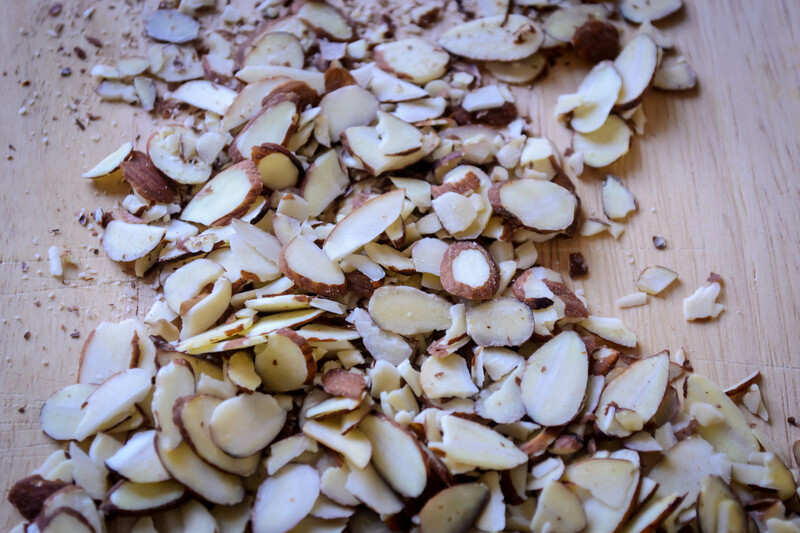 Sprinkle on the sliced almonds and get ready to roll. You have to do the rolling in small stages, I found. 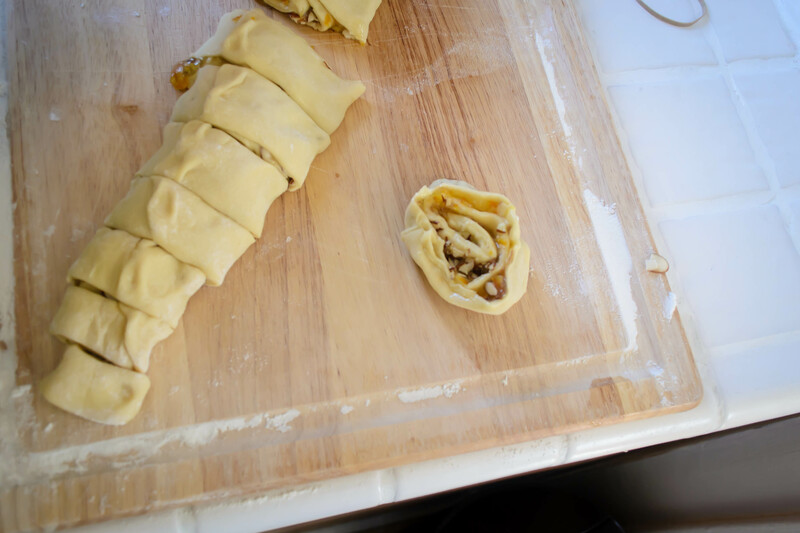 Begin at the middle of the longer edge of your dough rectangle and make a few tight rolls, but then move to the edges and help them catch up. 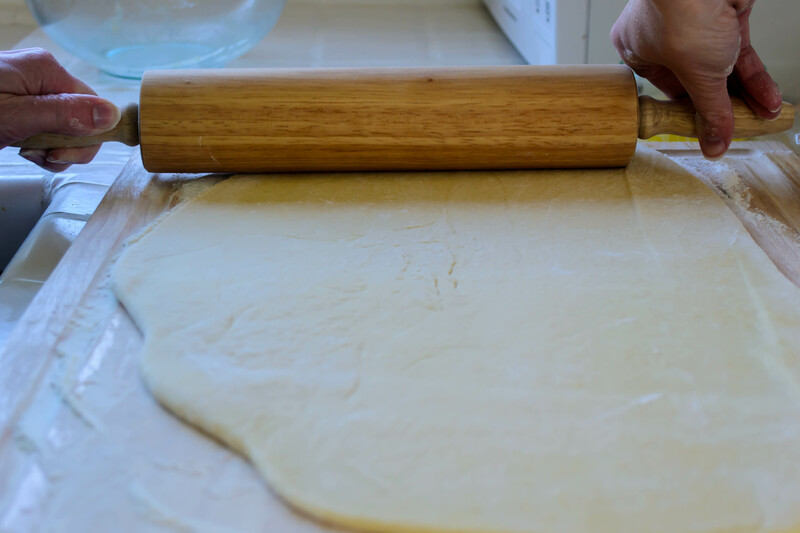 They don’t roll on their own, since the piece of dough you are working with is so big, so your fingers will be busy (and no doubt sticky) flying from side to middle to side again. 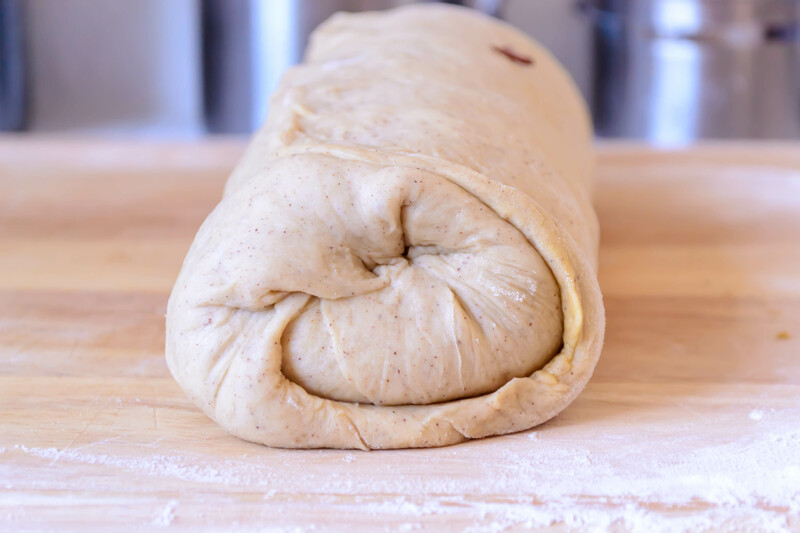 Continue this process until you have created a long, tight roll of dough. Some filling will unavoidably ooze out the ends, but if you’ve left a margin around all sides this should be minimal. Turn the tube gently so the outer edge faces up, then pinch it gently into the next layer to create a seam so your rolls don’t become unrolls. Carefully slice your rolled tube into individual portions. I ended up with about a dozen squashy, messy, less-than-round offerings. 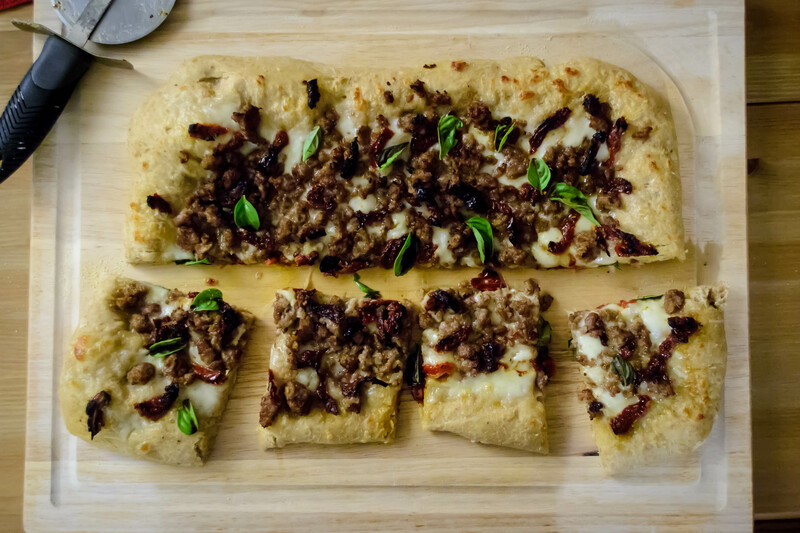 Deb at Smitten Kitchen suggests using a serrated knife and sawing gently, letting only the weight of the knife move down through the dough, to prevent the squashing I experienced. 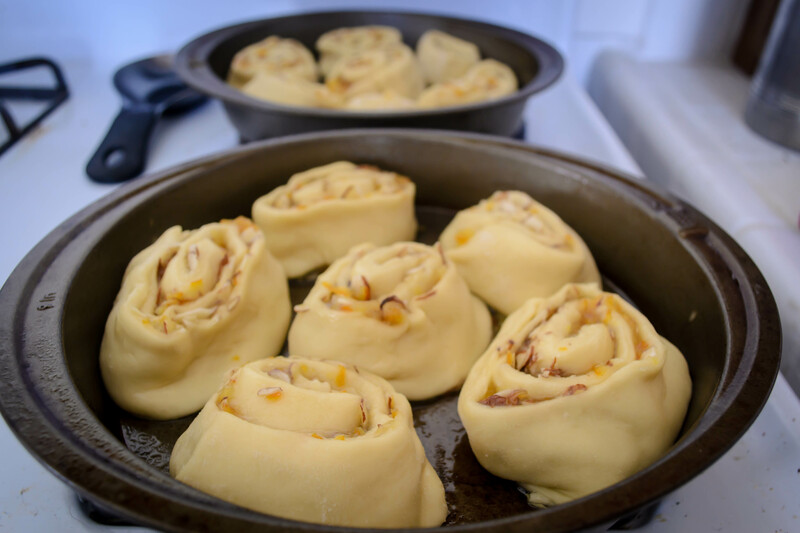 Nestle your rolls filling side up in greased baking trays – I used 9 inch cake pans – and let them rise again for 30 minutes. This would also be a good time to preheat your oven to 375F. 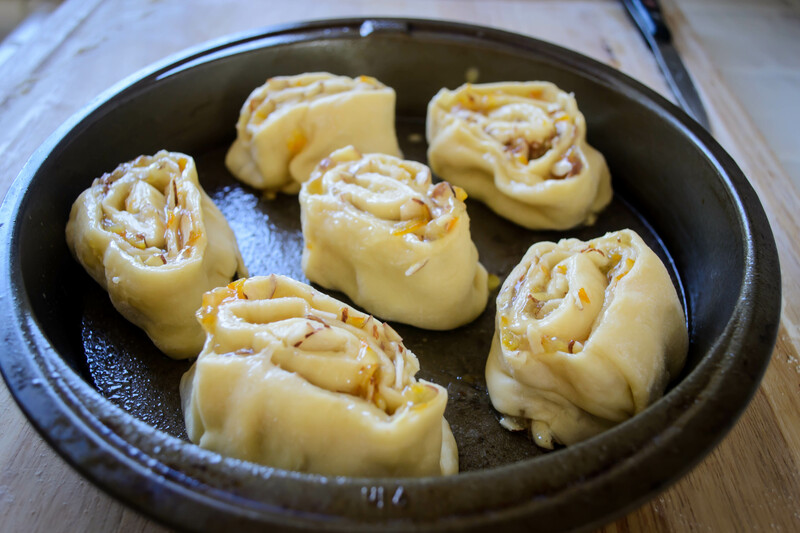 Stow your pans in the preheated oven for about 18 minutes, at which point the tops will be golden, the exposed marmalade will be somewhere between dripping and caramelizing, and the edges of each roll will have puffed against each other, some adhering thanks to the sticky filling. While they are warm, you can drench them in glaze or icing if you wish, or you can just gently liberate them from their pans and eat them with fork or fingers. I like to unroll mine as I eat, saving the extra buttery, extra jammy middle bit – which everyone knows is the best part – for absolutely last. Most of the photo credit on this one goes to N., who got really into his job as stand-in photographer this week! Thanks, honey.